305176.3 pixels long and 794 pixels wide. The 794 px width roughly equates to 8 inches. And, the length of each page is also close to 8 inches (height of the laptop screen). So, the number of 8X8 sq.inches pages can be computed as 305176.3/794 = 384 pages (approx. ), so far, if printed into a book with no augmentation of the font size, etc. If the size is computed as a simple vertical height, it's about 384*8/12, or 256 feet tall. 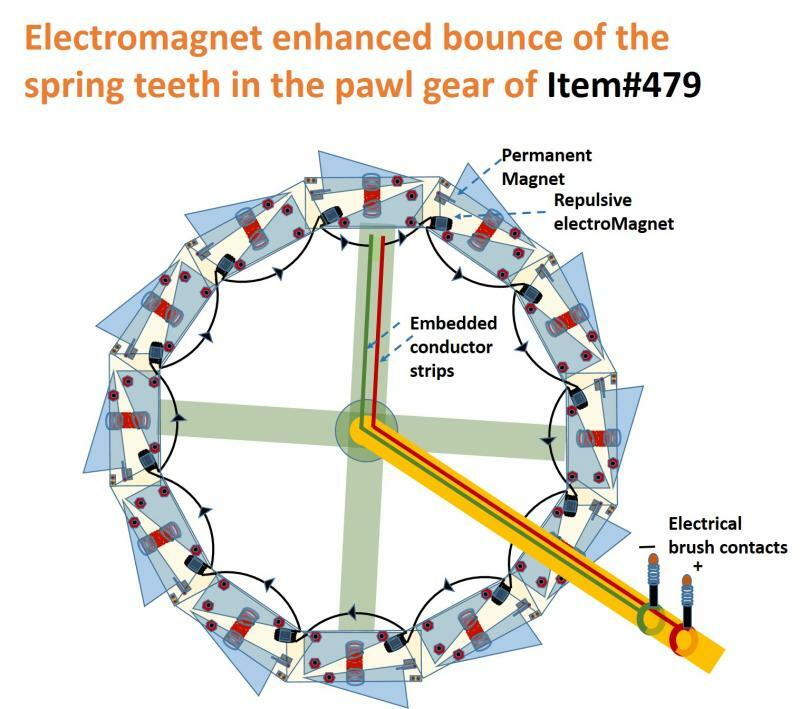 Compared to Item#222, the following design shows a higher/better level of electroMechanics integration, enabled by deeper teeth control. Again, the logistics of the gear shifts need to be controlled by a circuit such as the one shown in Item#223. When all the gearX supplies are off, you are in neutral. Since the pawl gears are engaged in electroMagnet repel mode, one can take advantage of the "relative speed meshing" discussed earlier - because the repel mode has some spring action. If depending on the speedometer analog voltage, 4 latches can be set corresponding to speed bands, one can configure automated (auto) gear shifts quite readily. In that case, you basically need two push buttons - neutral, and drive. An automatic transmission at the mechanical (not counting the electronics needed here) complexity of a typical manual transmission [https://en.wikipedia.org/wiki/Manual_transmission﻿], if one uses the EM tooth pawl gears. Of course, the above diagram shows only the forward gears. For reverse, one needs another three gears, one pawl gear on the input shaft, one fixed teeth rachet gear on the ouput shaft, and a third direction changer. One should not be able to go to 'reverse' unless the speed is 0. From 'reverse' you should be able to go to 'neutral'/'drive', only when the speed is 0. Although the spring based design (Item#478) is simple and adequate, there will be a small but finite friction between the spring teeth and the teeth of the pinion that the rack drives, during the recovery cycle. While the friction can be minimized by a proper choice of the spring constant, and also by tooth shaping, it may give a slowing resistance to the rotating pinion. For example, a bicycle runs for a long distance in the pedal idle mode even with the slowing resistance in its rachet-pawl hub; but, if the slowing resistance were not there, it would go even further. 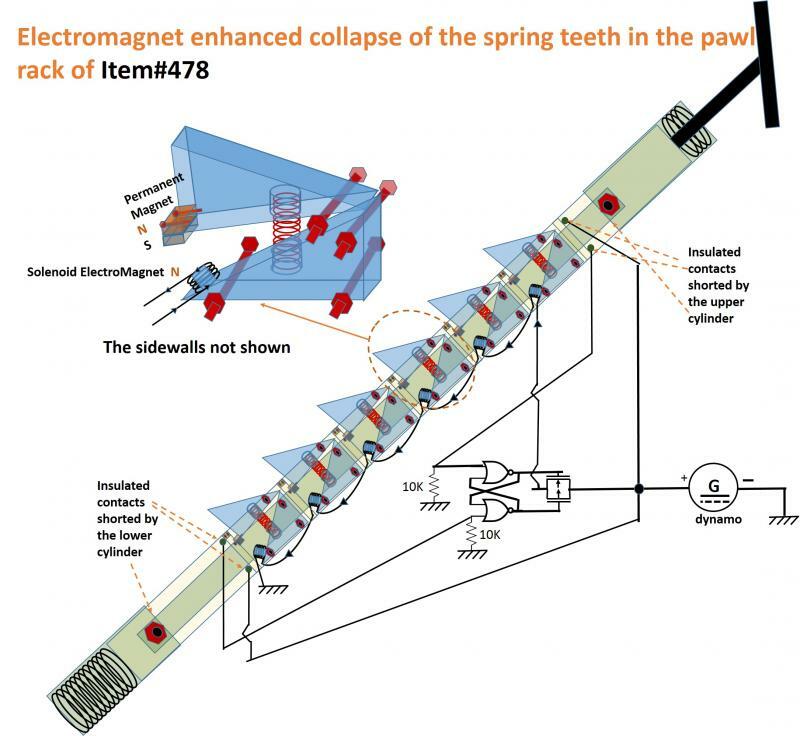 In order to totally zero out the friction, one can add little electromagnets to the spring bases pulling down liitle permanent magnets on the spring teeth during the recovery cycle. The electro-magnet pull must overcome the spring push. One good thing about the open design is that one can enter electromagnet wires from the backside. Two switches on the piston located near its lowermost and uppermost positions will turn the electromagnets on or off respectively. The electromagnets can be powered by a dynamo engaged to the pinion. 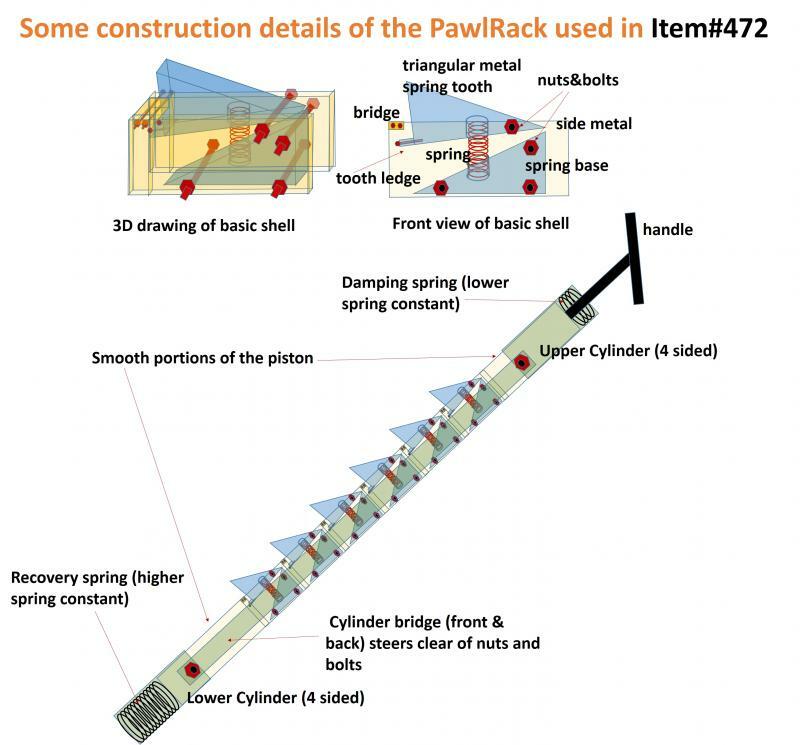 Drive side application of the Pawl Gear and the Pawl Rack (Item#478) is expected to revolutionize mechanical power transfer - some previous Items indicate that. So, it's a good idea to look at their construction. Note that the bolted metal bridge between the two sidewall metal plates stops the ledge (screwed on to the spring tooth) from going further up when the middle spring pushes up the tooth. The spring base is hard connected to the side plates using three nut-bolt pairs. The spring tooth can freely rotate around the bolt rod near its thin end. There are holes to accommodate the spring on the spring tooth and on the spring base - they will always keep the spring in place. Please, note that when the basic shells are arranged in a circle, it becomes the pawl gear of the piston-pawl drive discussed earlier. Since container ships are of high width (10m-50m), the length of the wheel bridge axle would be rather long if placed in the ship. Also, to avoid large diameter for the wheels you would need to make cutouts on the ship's sidewall closer to the water level. 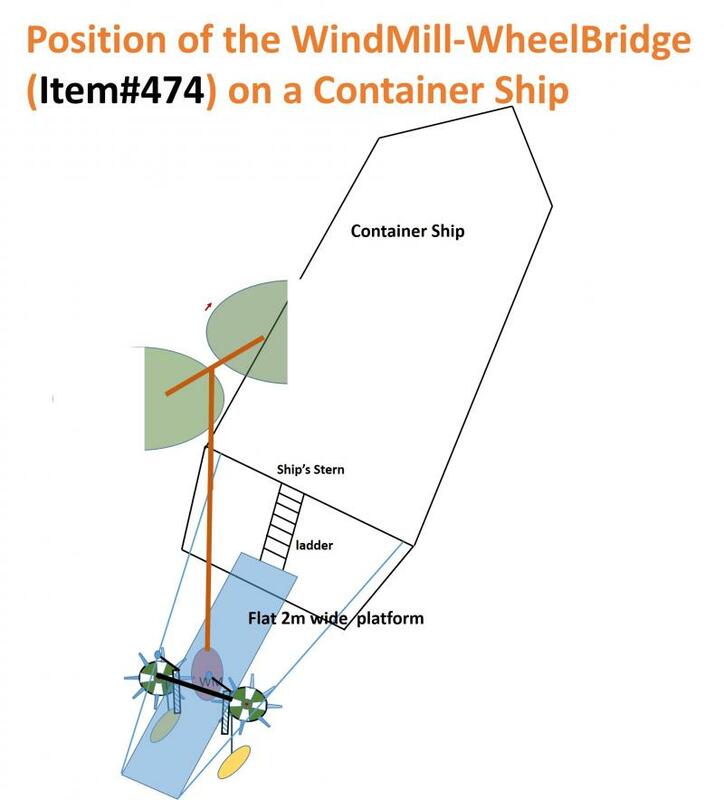 To avoid these problems, one can place the windMill wheelBridge on a low and narrow cantilever platform projecting out of the stern side of the ship. 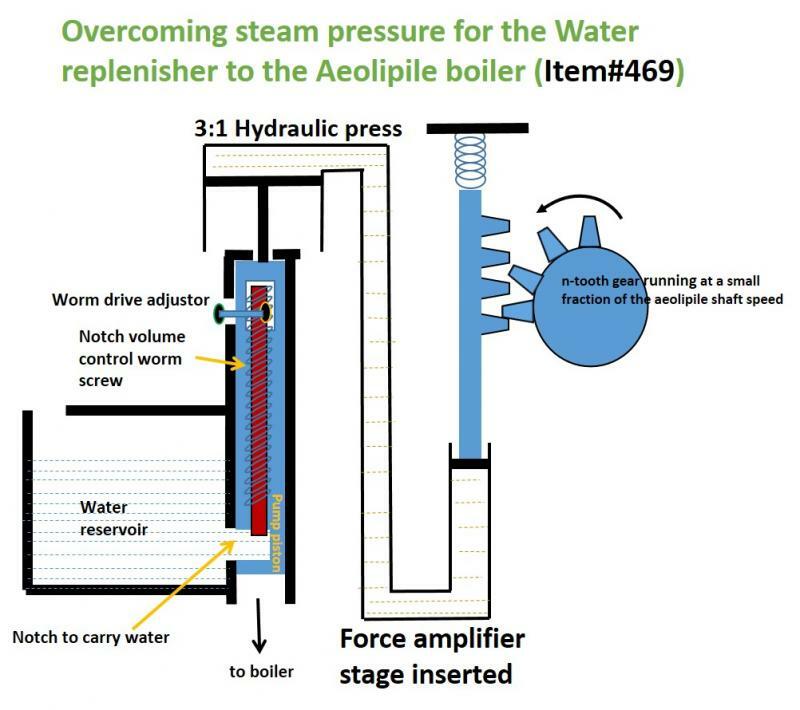 The problem with the water replenisher of Item#469 could be that the pressure of the replenisher piston driven by the Aeolipile itself could be insufficient to overcome the steam pressure (2-3 times the atmospheric pressure, like in a pressure cooker). So, a force amplification stage is needed. Note that the play of the replenisher piston needs to be smaller - for example, a play of 6 inches on the right arm of the press produces a play of only 2 inches on the left. Because, the work done (force X distance) is same on both sides. A hydraulic press works on the principle of the Pascal's law. Note that the moment of inertia spring balls prevent excessive rotational speed by pushing out the balls under centrifugal force (see Item#447). The lower ends of the elastic chords tied to the lower bearing hooks allow default rotation. Manually interrupting the chords causes braking. For parking brake, first completely brake the windmill, untie the chords from the lower hooks, tie them up to the upper hooks that are located on the body of the pipe. Note that there are four wheel bridges. Three of them are equipped with three PRP stages on each, working in parallel. So, a maximum of nine rowers can simultaneously push the boat, three on each bridge. 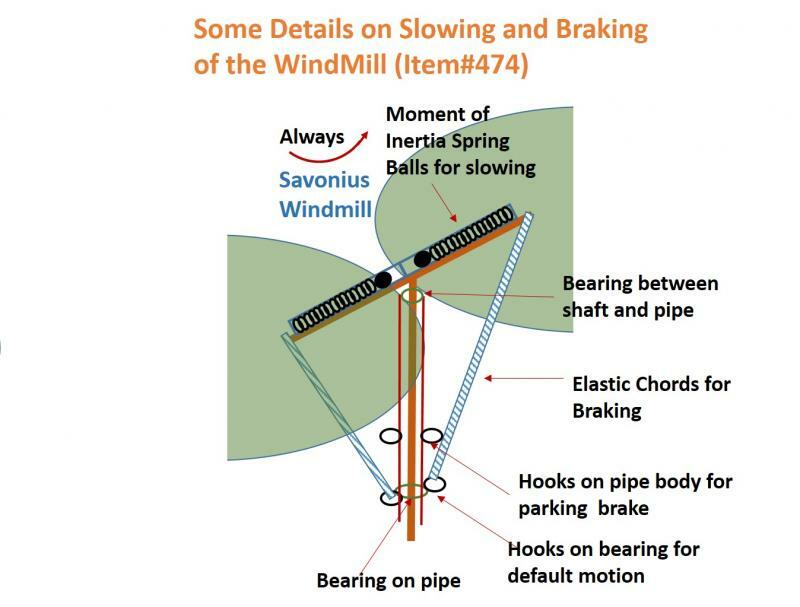 The fourth bridge is getting pushed by a Savonius (vertical axis, high torque) windmill (WM stage transfers power through a pawl gear as in Item#447)- this works as a convenient replacement for a sail. 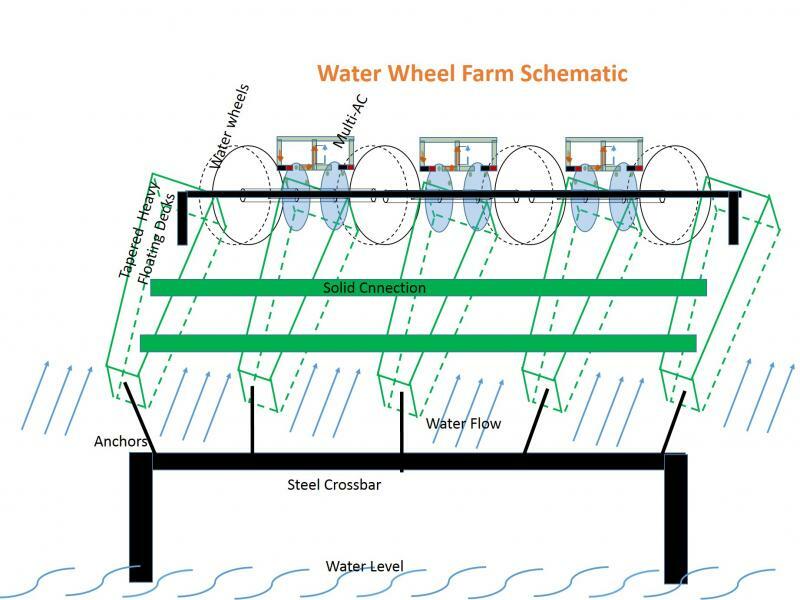 By noting the relative positions of the wheel shafts and the cutouts (see Item#473) one can see that the second bridge from the right is disengaged (wheels taken out of water). That means, at this time, six rowers may be working, plus the windmill bridge. The Savonius (discussed in Wikipedia, under 'windmill ship') is a pair of ellipsoidal cups that works on the basis of the difference in air drag coefficients between the open side of the cup and the ellipsoidal side. 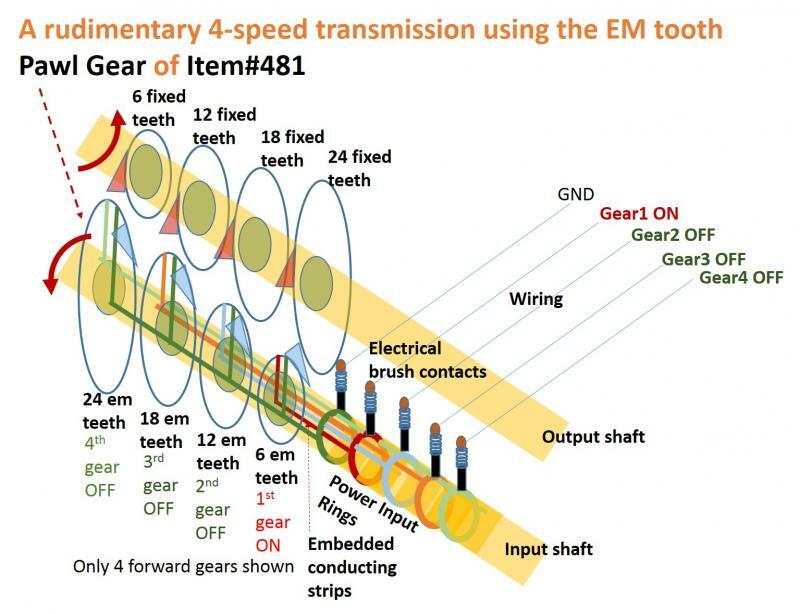 What is the the WM transmission going to be like? It will be like a manually clutched engage/disengage as in a manual transmission car - except that the clutched position needs to be held, so that you can adjust the height of the bridge as needed. For stronger wind speeds, a lower bridge position will push the boat harder. It will also ease the load on the matrix galley rowers. 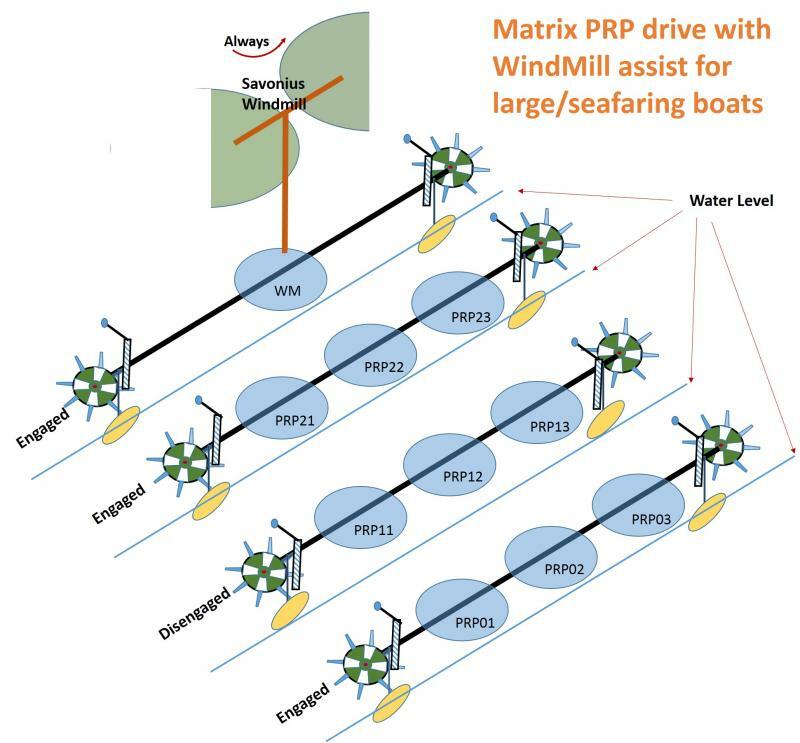 The result is an increased speed of the matrix PRP boat over the ancient galley vessels - 3-4 knots to 10-15 knots, and with reduced effort. 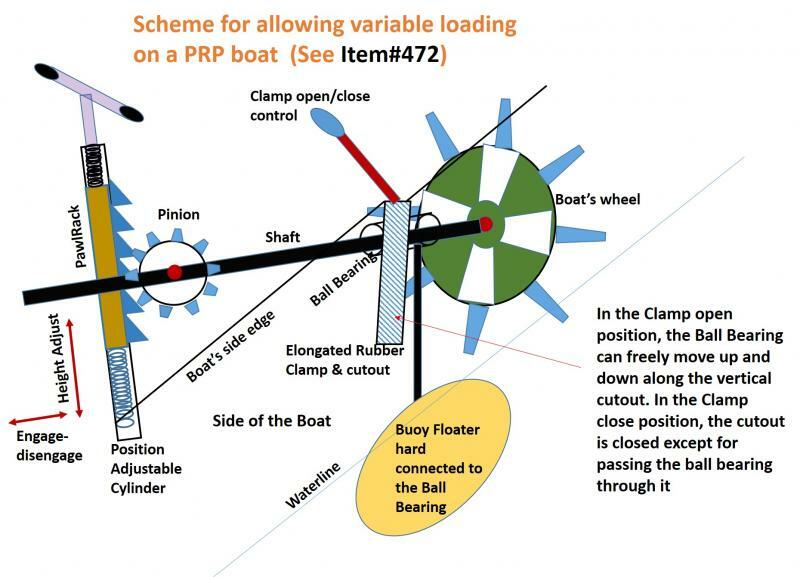 The PRP paddle-wheel boat design shown in Item#472 is good for constant loading as with boat racing. But, for variable loading situations such as with carrying cargo or passengers, the wheel paddles can get excessively submerged, or, can come out of water. So, there needs to be a scheme that makes sure the centers of the wheels stay at the same height above the water under variable loading. 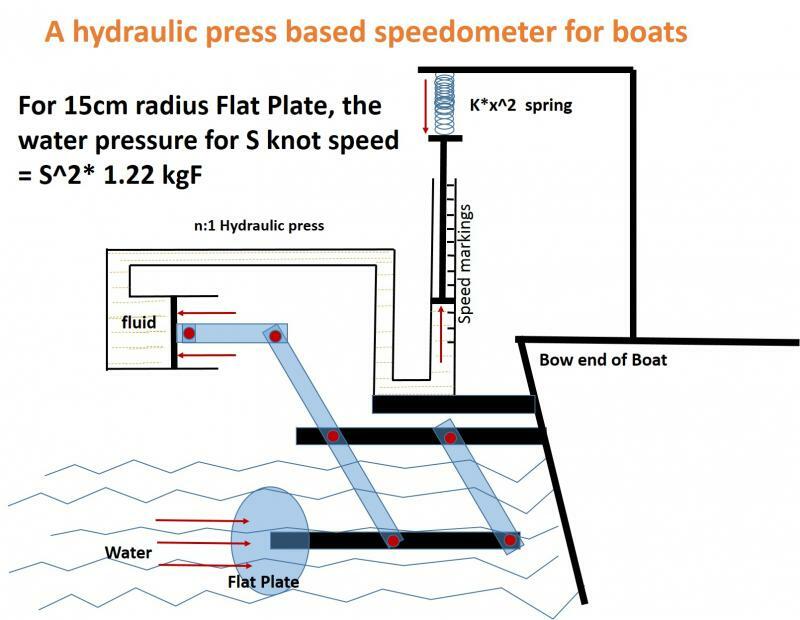 The following diagram shows a scheme that allows the wheels and the connecting shaft to freely float with the help of buoy floaters, before engaging the pinion for action. Please, note that the paddle-wheels and the shaft need to be made of light but strong material such as special plastic. This will have two benefits. One, that you need to spend less energy moving them (so, all the energy goes into slicing the water), and, two, that small floaters on the two sides can balance the weight. To note is that only 1/4 cubic ft of water displaced on each side can balance a weight of 30lbs. Note that the spring-teeth are on the Rack, and the pinion is a simple spur gear. 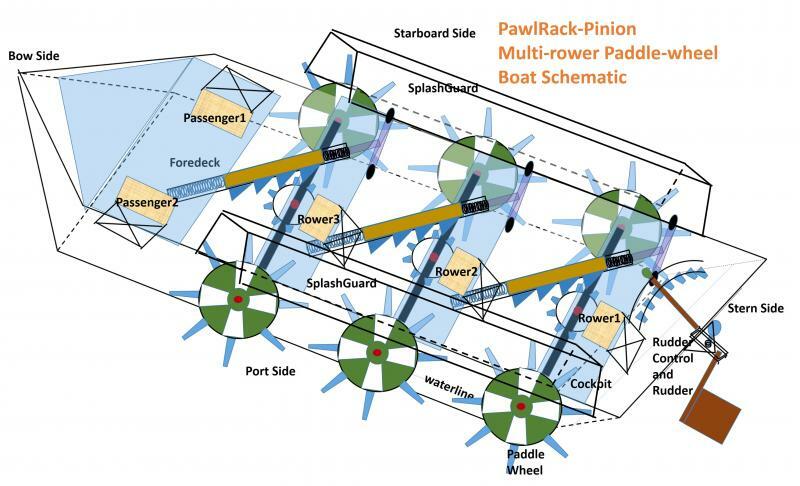 This design will have higher power due to the use of paddle wheels, as opposed to the propeller (Item#391) which is more suitable for engine driven boats. The desgn is meant for boat racing, where many PRP stages can be used. Also, this can be used for carrying cargo with multiple rowers pushing the boat. If there are even number of stages, half of the rowers can be in the drive cycle (push down) while the other half in the recovery cycle (pull up) of the piston. The splashguards prevent water from splashing into the boat. Note that there are two passenger seats where the rowers can take rest from time to time. One of the problems of power supply grids is that you need to store energy during non-peak usage times - which will be released at peak usage times. This process is inherently lossy. But, the Aeolipile driven multi-AC allows for adjusting the production parameters by sensing the power usage. Let's say, the power plant is supplying to multiple households in a community that uses electric ovens for cooking. So, at times when people cook their food, the peak usage happens. This is sensed by a voltage sensor at the power plant - a peaking usage draws more current, tends to reduce the output voltage. The sensor operates electronic circuitry that would augment the number of turns on each coil, put higher number of coils in parallel, increase the heat to the boiler. Again, when the power usage goes down, the reverse adjustments happen. So, no need to store energy. The scheme would look like the square wave to sine wave filter of Item#s 458,459 - only draws the fundamental sine out, and nothing else, wastes nothing, conserves energy at source! 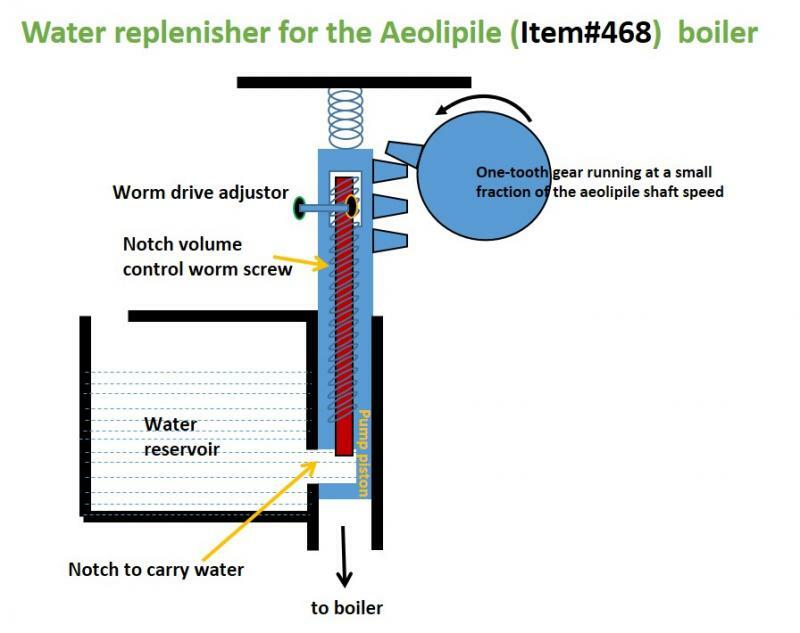 Note that the worm screw can be manually pushed in with the Worm drive adjustor bolt - this will reduce the notch volume, so less water will be carried into the boiler in each cycle of the pump. 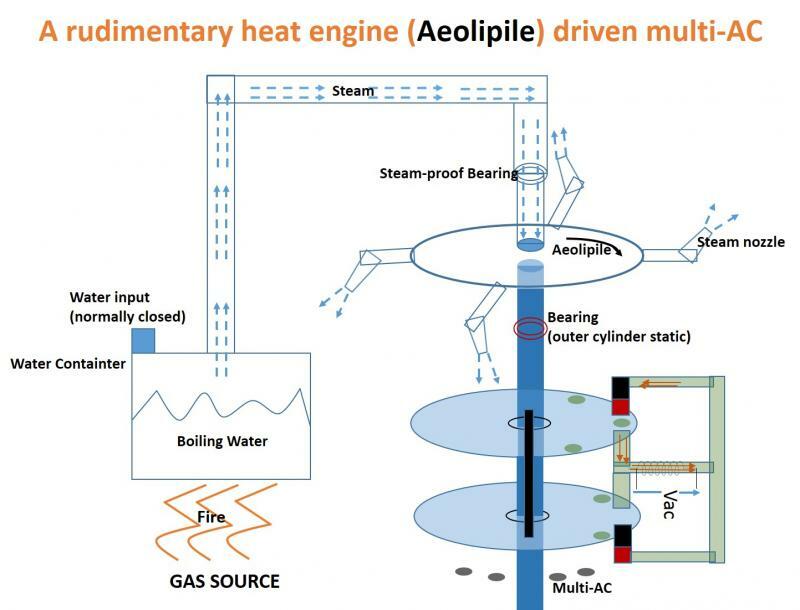 Since the one-toothed gear is tied to the aeolipile shaft, water is replenished faster as the aeolipile rotates faster, i.e., more steam is generated in the boiler. While the one-toothed gear pushes the piston down, carrying the water-filled notch to the boiler, the spring at the top of the piston immediately pulls the piston up, to the replenish position of the notch. The fire could come from any other source - but, a gas burning fire is cleaner. Note how the steam jets emerging from the nozzles create the torque. The water input could be automated with a level sensed/timed valve system. 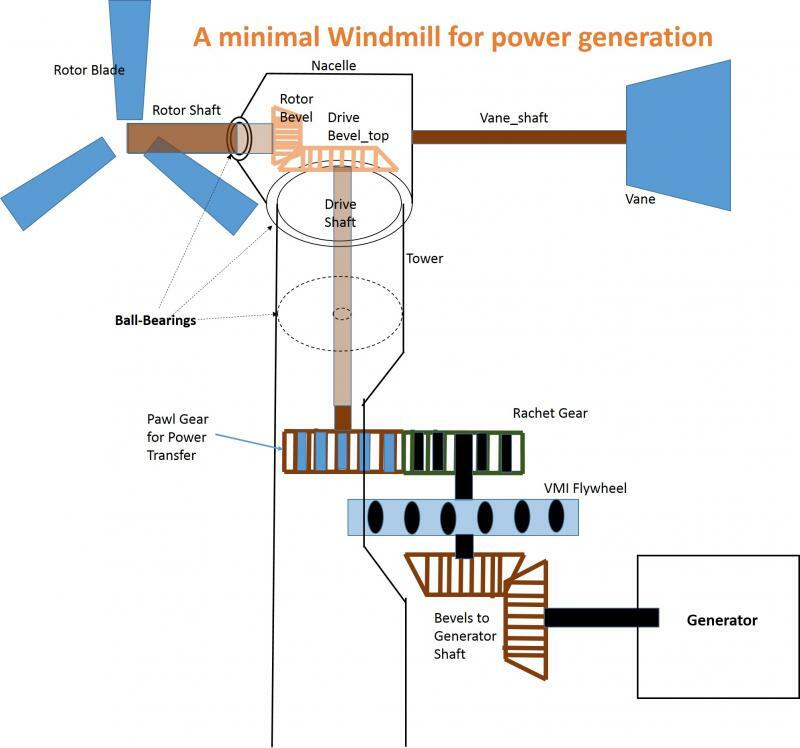 Particularly enthusing should be how the multi-AC wheels (e.g., Item#462) will make power generation out of small windmill farms simpler. Goodbye expensive nacelles, and simply connect the rotors of a high-torque *vertical-axis* windmill directly to the multi-AC wheel, probably through a pawl gear (see Item#447), and get the ACs out. Rectify the ACs and diode dump the currents into a low voltage line running through the farm - should be good for farms that are 1000 feet square [0000 AWG carrying 100 Amps will produce a voltage drop of about 5V over 1000 feet]. You can then use my depletion MOS charger (see Item#s 438-446) to fill up battery banks out of the DC line. Also, you can use a multi-brush version (to multiply the current) of the wheel based DCtoAC (Item#454) which can convert the battery watt-hours into AC for supply. Note the tapered shape of the connected floating decks that are anchored to the steel crossbar. It helps create a funneling effect to increase the speed of water just below the wheels. Since the decks are floating, you will never have to adjust the height of the wheels for optimum speed - their centers will always maintain the same height above water. Only 4 wheels shown in this example - but, there could be 100s in the middle of the river to generate serious power. 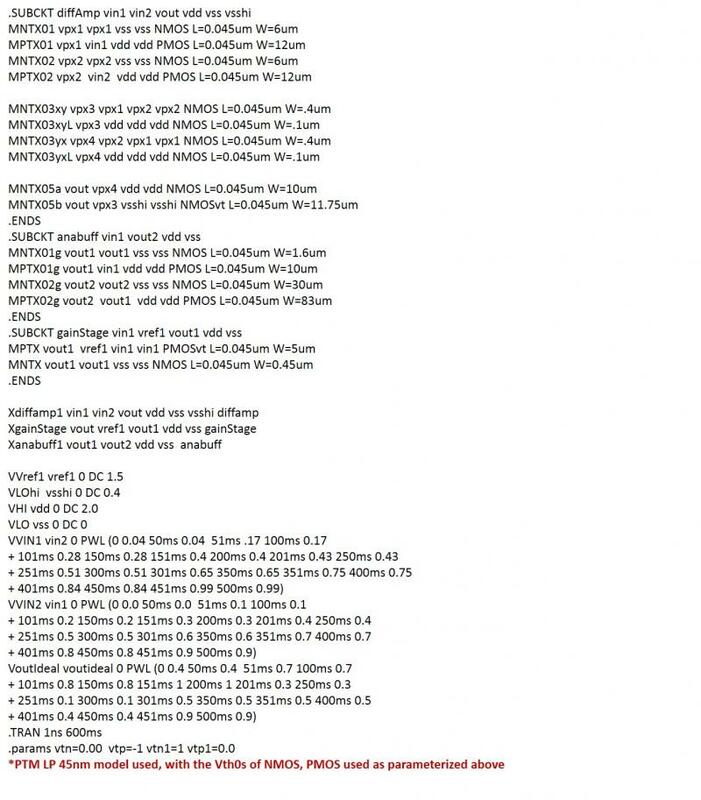 Also, any processing of the power output out of the multi-ACs is not shown here, should be similar to the processing discussed above, for a windmill farm. 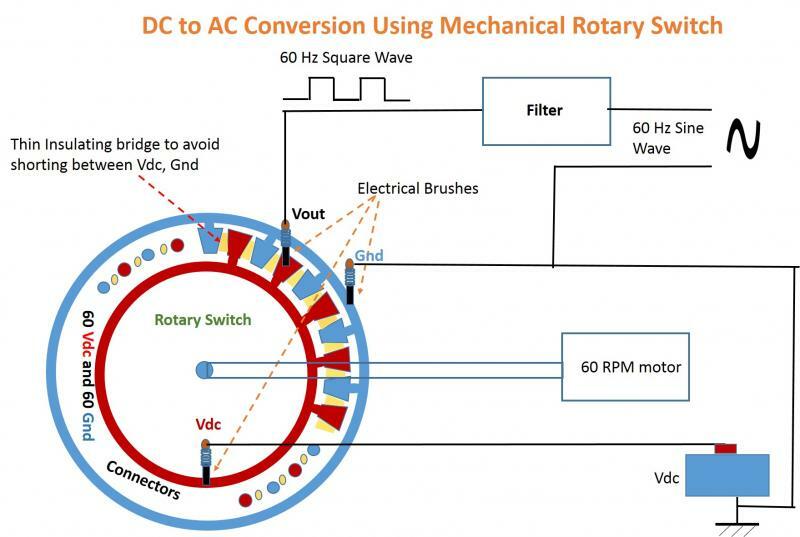 Some interesting features of these generators include the possibility of running them with DC electromagnets, instead of with permanent magnets. Now, if the electromagnets are switched off, nothing happens. When the electromagnets are on, but no current is being drawn from the generator coils (open circuit), there is braking action because magnetic flux opposes change induced by the moving ferro pieces. The braking action has good moment because the ferro pieces are on the periphery. When current is being drawn from the generation coils, the device works as a generator, and the braking action reduces since the current itself opposes the change in flux. So, the device can work as, a) a non-entity, b) a braking device, c) a generator with mild braking [somewhat like regenerative braking]. So, when you are running the train on a flat surface, you may want to switch off the electromagnets to turn the devices ineffective, and switch the electromagnets on to help in braking (rarely). While going uphill on a slope, let's say, to a hill station, the wheel-fitted devices need not be used at all, so, the electromagnets can be kept off all the time. While going downhill, maybe returning from a hill station, use the devices in the generator mode with mild braking. Basically converting gravitational potential energy into electricity. But, how would you carry the battery banks uphill to the elevated location, when they are used up? Put them on a wagon, and add it to the train going up, when it is lightly loaded. But, a greener solution would be to use a windmill power driven ropeway. If each ferro piece is 2 inch dia, the belt needs to move at 20 feet/sec to generate 60Hz AC. That is less than 15 miles/hour. Note the staggered (by design) positions of the ferro pieces in the top and bottom segments of the circulating belt. The belt configuration is particularly useful in generating electricity out of rotating parallel axles of moving vehicles, a train car for example. In principle, there is no difference between conventional generators, and the wheel/belt based generators - except that in the latter you achieve the same level of d(flux)/dt with a much gentler speed, also, you get the feature of incrementally adding/removing batteries, in addition to be able to stabilize the voltage output more easily. If there were to be 60 magnets and 60 demagnets, each with 2 inch dia, on a wheel like that in Item#463, the wheel would be 20 feet in circumference - which is roughly 6.4' in dia. This wheel would require to rotate at 60 RPM to generate 60 Hz AC. The same would be the size of each wheel in the Item#462, with 60 ferro pieces (staggered) in each, rotating at 60 RPM. Since a large number of AC batteries are energized from a single wheel (Item#463) or twin wheels (Item#462), one can think of renting a coil or more on a monthly basis, rather than paying for units consumed. One multi-AC generator can probably be used to supply to 25 or more households. Each coil is independent of all others, yet in phase. So, one can connect multiple coils in parallel for more current. Any user renting coil(s) can use or save (probably in DC batteries for later use) all the electricity as is supplied through the rented coil(s), and no more. One advantage of the twin wheel scheme is that if a particular coil burns or gets damaged, it can be more easily replaced without stopping the wheels, disturbing supply to the other coils. Also, with the twin wheel scheme electromagnets could be used in place of permanent magnets. The multi-AC generator of Item#461 can also incorporate a demagnetization cycle, as was done for the generator of Item#451 in Item#462. To avoid complexity in drawing, only some of the top coils/cores are shown in the above figure. Obviously, an inner circle of opposite polarity magnets (demagnets) have been added in staggered positions on the wheel. 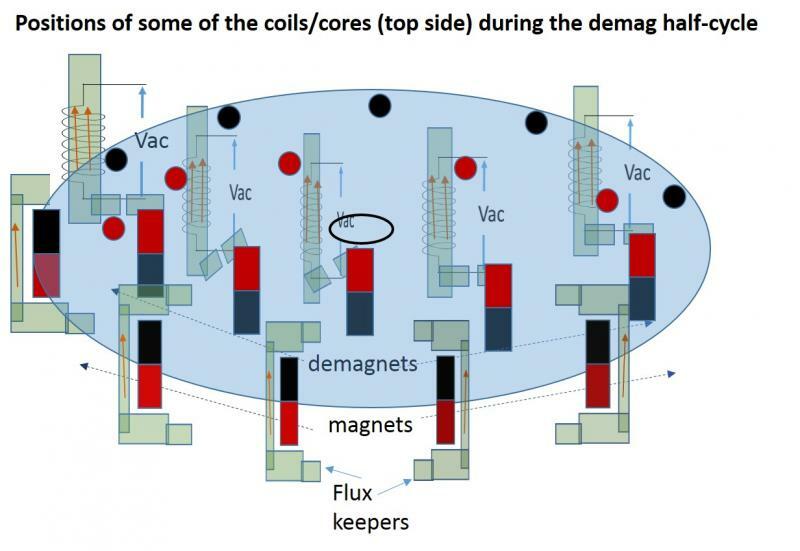 The additional pieces of ferro terminals added to the source ends of the coil-cores face the inner demagnets' magnetic terminals during the demag half-cycle. At that time, the magnets on the outer circle stay within flux keepers - the flux keepers added to the stator side help keep the flux environment clean. 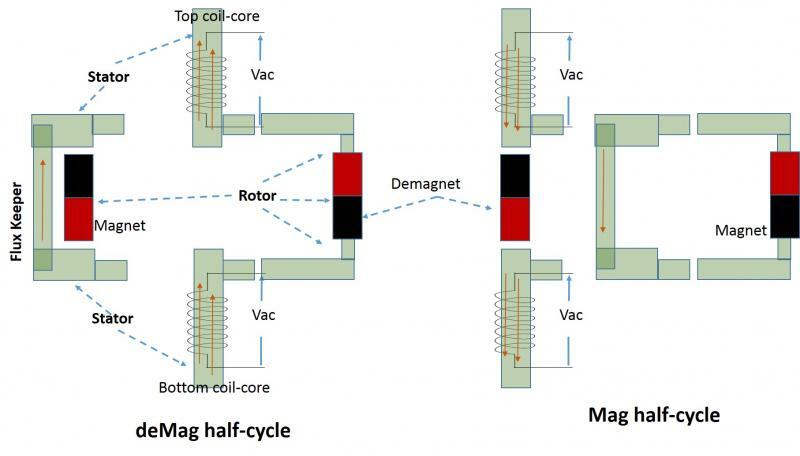 During the magnetization half-cycle, the outer circle magnets face the bottom/top ends of the coil-cores like in Item#461. At that time, the flux keeper terminals face the demagnet terminals. We zoom into the details in the following diagram. In fact, if needed, one can draw power out of the flux keepers also, by placing coils around them. Note that the lines of flux through the coil core are pointing upwards during the magnetization cycle, when the left loop magnetic circuit closes through the ferro cylinder on the mag wheel, now the right loop is open. Next, the right loop will close, and the lines of flux will point downwards through the core - that's the demag cycle. When the right loop closes, the left loop will open, due to the staggered positions of the ferro cylinders. This is more like an electric transformer where flux changes direction in every cycle. Also, in a single phase generator (indicated in Item#452), flux changes from mu0*Hmax to -mu0*Hmax in each cycle. 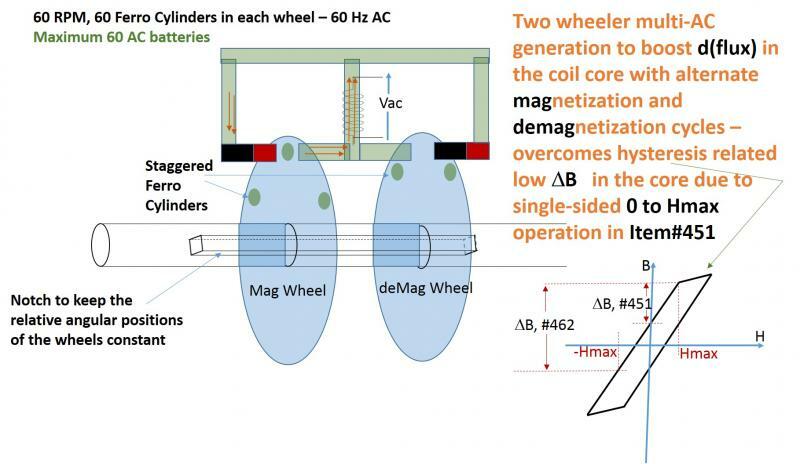 With 10 magnets on the wheel, one can accommodate 20 such generation coils, all working simultaneously. Please note the vertical ferromagnetic bar on the side - this will complete the magnetic circuit. The rotating shaft (360 RPM, equivalent to 6 revolutions per second) rolls inside ball-bearings at the center of the stator discs, but, it is hard-connected to the rotor. 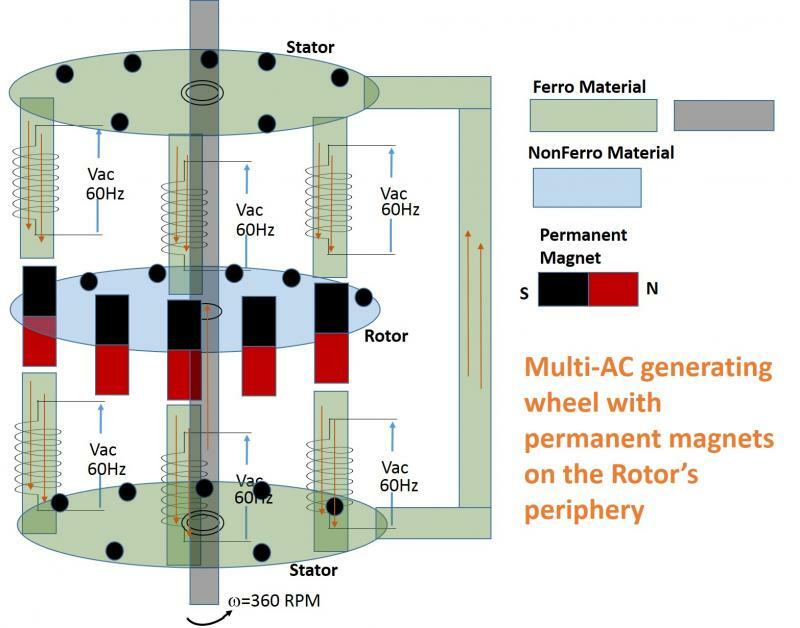 A larger rotor with 60 magnets on the periphery would require only 60 RPM (for 60 Hz AC) , and could accommodate a maximum of 120 generator coils. One thing to note is that there should always be an even number of generator coils/cores present - if there is one on top of a magnet, there must be one below it. Unneeded generator coils/cores can be easily unscrewed off of the stators. The permanent magnets can also be unscrewed off if needed to be replaced. If the rotor is rotated faster, higher frequency AC with larger RMS will be generated. Now, if the AC is to be rectified to charge up batteries, that should not be a problem. Although both methods of generation involve a rotating disc inside a ferromagnetic loop, there are important differences. 2. Faraday's wheel set the stage for all later generators that involve a relative movement between a conductor and a magnetic field, where the Lorentz emf come into play, and the Fleming's right hand rule is used to determine the direction of the induced current. In the multi-AC generator, no conductor is moved in a magnetic field, here the principle is different. 3. The structure of the multi-AC generator is completely different, and the wheel is not used as an electrical conductor, unlike in the case with the Faraday wheel. 4. No electrical brush contact is needed for the multi-AC generator. 5. With the multi-AC generator, multiple AC generators can share a single wheel. The above circuit analysis shows that the minimum DC watts drawn would not go below 278.46W - the simulation of Item#458 shows a value of 280W. The theoretical limit of conversion efficiency would not go above 87.7% - the simulation got 85.35%. The dB separation between the fundamental (f1) and the third harmonic (f3) in the output across the resistive load (Rout) is computed above as 31.44dB - compares reasonably well with ~33dB from simulation, see FFT plot below. The discussion in Item#s458, 459 goes to show that a good filter can go a long way in saving DC power drain from the batteries. With the series LC filtering shown, the conversion efficiency is limited only by the small resistance of the input circuit - batteries plus wheel. AC power delivered to DC power drawn efficiency >85%, with DC power drawn reduced from 476W in Item#456 to 280W here. Note that L*C= 1/(2*pi*60)^2, so that the reactance of the LC series circuit is 0 at 60Hz (f1). The f3, f5, ... components are highly attenuated, and they have no parallel path to ground. 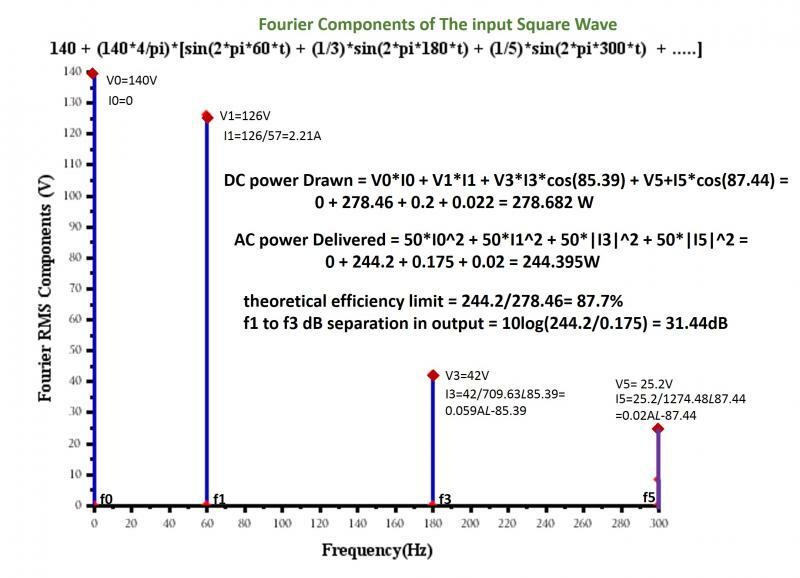 Also, the series Cx blocks DC.﻿ So, the power output and the conversion efficiency are unaffected by the DC mean of the square wave - that is, the outcome would be the same if the input were a -140V to +140V square wave. One can define an independent current source in LTspice, where the expression of the current involves the integral (function 'idt') of the I(Vvin). This can be accomplished by adding two additional lines to the spice code of Item#456, as shown below. Note that the integral function I(Bidt) changes by -28.25 mA-s during the 8.32ms when Vin=Vdc (280V). Hence the Iav from this method is -28.25/8.32 = -3.395 A, that matches closely with the -3.401 A value computed in Item#456. The screen zoom based Iav (~-5.25A) estimation in Item#454 was inaccurate due to a bit of the sides of the appropriate zone coming into the zoomed-in display. So, I exported the I(Vvin) data into a file and deleted everything except the appropriate portion of the file that corresponds to a positive (280V) half-cycle of the square wave Vin. 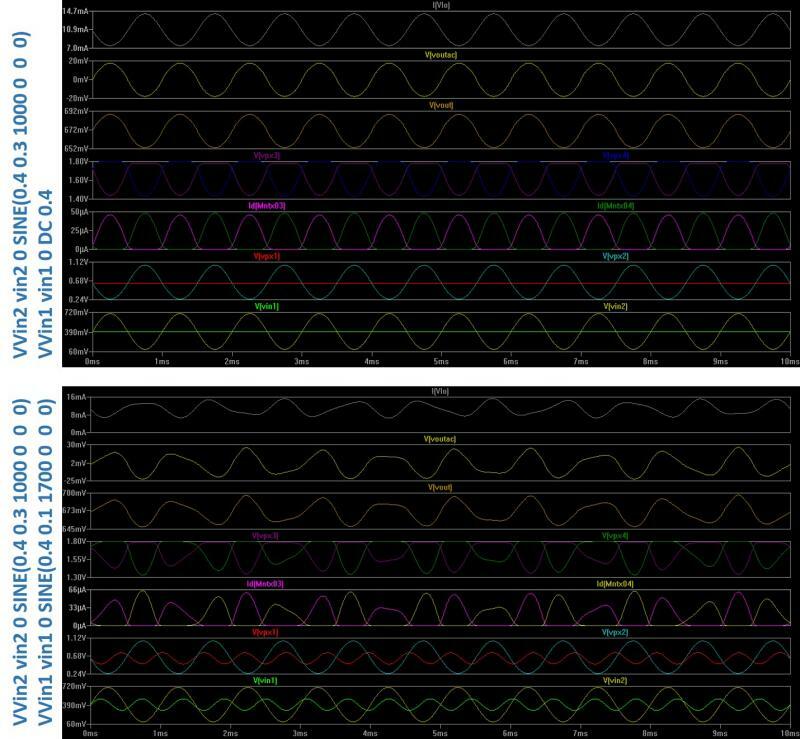 This truncated file was used for plotting and computing the Iav, using a scilab routine. Please, note that this more accurate estimation leads to a DC power drawn value of 940.8W from the battery (the earlier estimation of 735W was inaccurate). 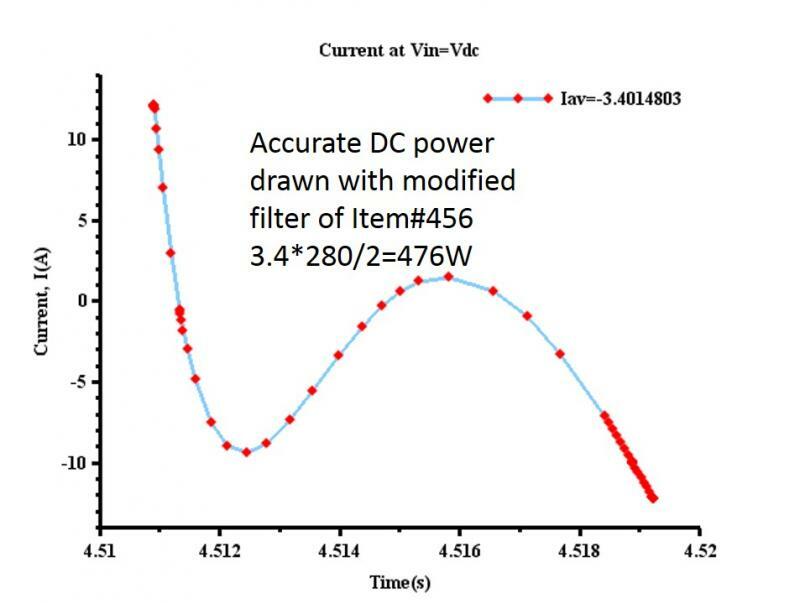 This means that about 700W power is being wasted - this is happening because the fourier components other than the fundamental and the DC are seeing a very small impedance to the ground, a lot of power is getting wasted in the charging/discharging of the filter caps. We will see next if we can reduce this wasted power. 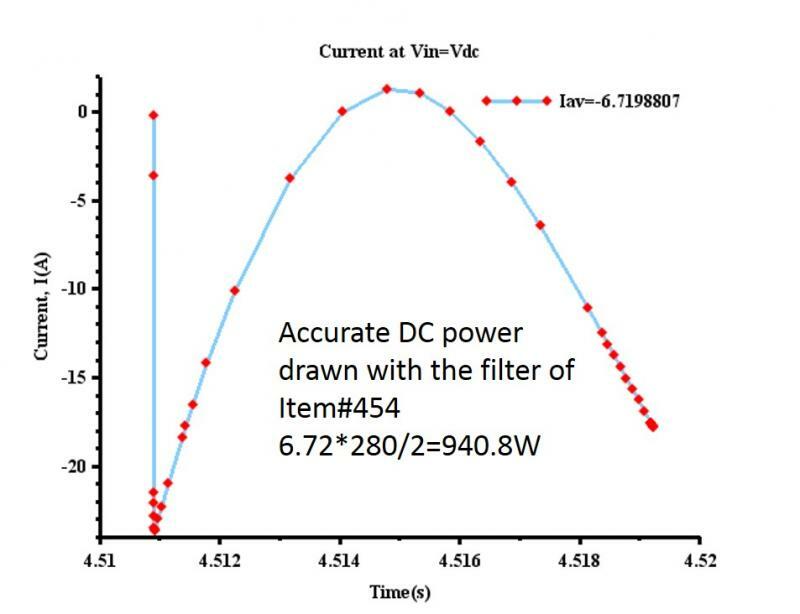 Although the DC to AC conversion shown in Item#s 449,450 is a workable solution, its conversion efficiency (AC power produced/DC power drawn) is low, mainly due to the losses in the transformer primaries. Here is another possible scheme that avoids the transformer, and should look rather direct. 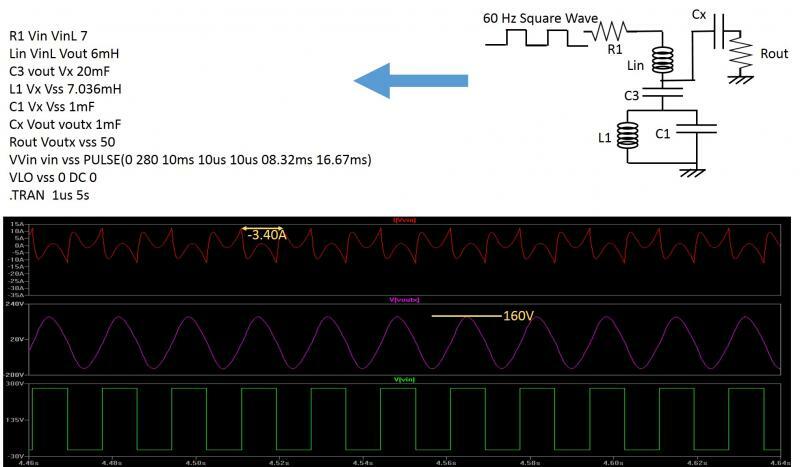 Note that the square wave is generated by the rotating wheel with slightly raised trapezium shaped Vdc, Gnd, and insulating connectors that are scanned by a fixed spring brush giving the output. The Vdc and the Gnd potentials are also being fed in through brushes to circular strips. For a 60 RPM disc, one needs 60 Vdc, and 60 Gnd trapeziums, in order to generate 60 Hz. For a 600 RPM disc, one would need only 6 of each potential. The filter can be a simple traditional LC tank circuit (https://www.allaboutcircuits.com/textbook/alternating-current/chpt-6/parallel-tank-circuit-resonance/﻿), a series-parallel version is used - see a simulation below. Note that at 60Hz, the parallel L1-C1 has infinite impedance - so it passes the 60Hz (fundamental) sine wave unattenuated. The series L3-C3 addresses the nearest 3rd harmonic - its impedance is 0 at 180 Hz. It also blocks any DC from shorting to ground. For 280V pulse (coming from 280V dc), one gets ~155V peak AC @60Hz - which is the regular supply voltage, 110V AC (rms). The 7 ohms input resistance to the filter could be an overestimation - it approximates the dc battery resistance, plus the wheel resistance. A lesser input resistance would decrease the output impedance of the filter even further. 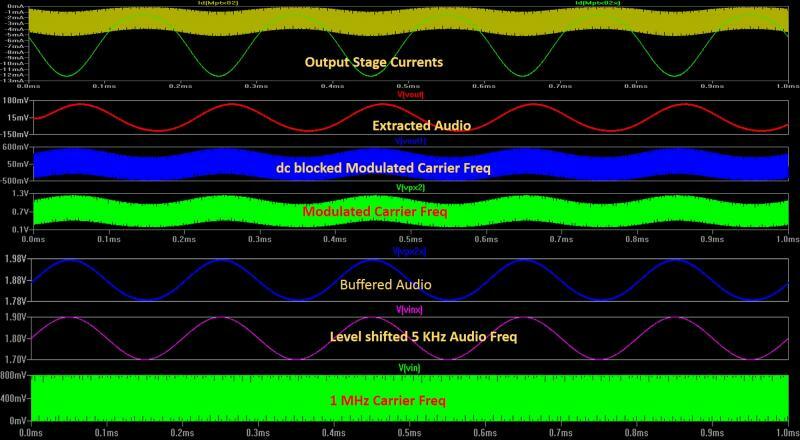 The Cx is a dc blocker to the output circuit. 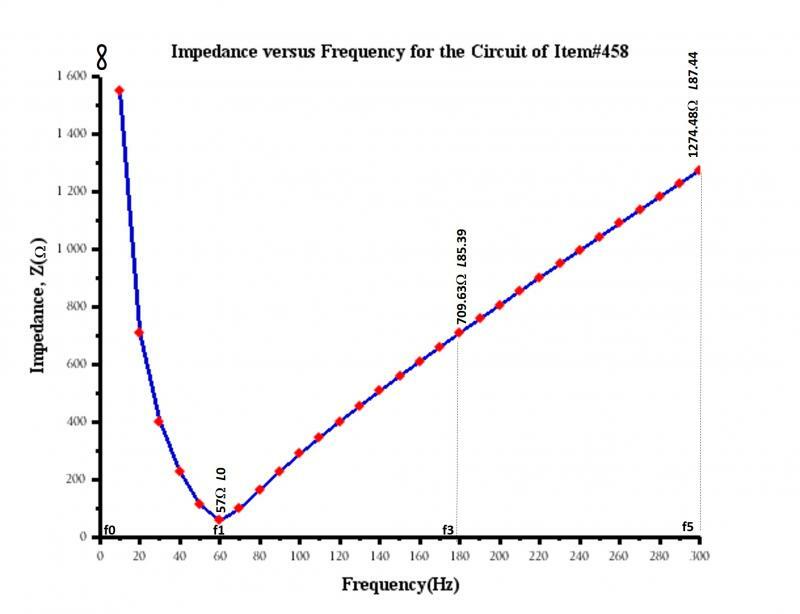 The fundamental component would only deliver about 317.74 W to the 50 Ohms load. So, the effective power efficiency is 242/317.74, or 76.1 %. As is known, magnetic flux always tries to maintain itself and resists change. That's the basis of the retardation (as mentioned in Item#452) exerted on the rotating disc. When a particular ferro strip is trying to enter the gap, the exising field will try to oppose the entry, and when the strip is trying to leave the gap, it will try to pull it back. The disc needs to have sufficient energy to break through this barrier in order to create the delta(flux) in the core. But, it loses a bit of that energy in each traversal, that will subsequently be converted into the electrical power delivered by the generator. 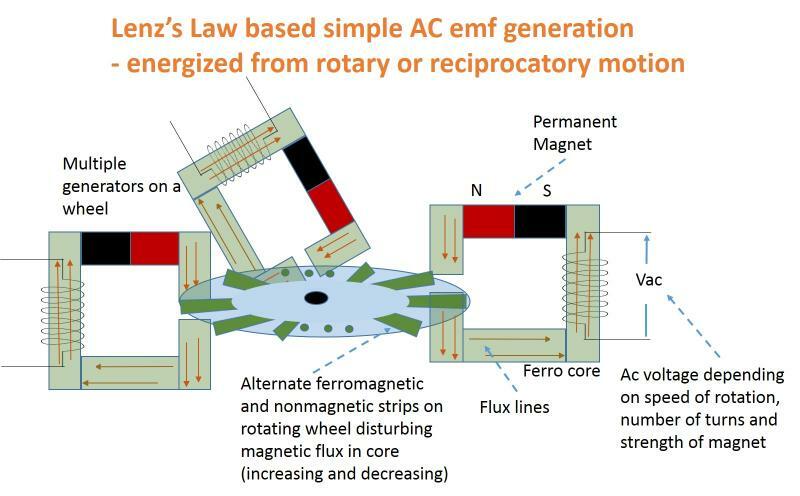 The same tendency of the magnetic flux is also responsible for the induced emf in the coil, as per the Lenz's law. But, the induced emf by itself cannot oppose the delta(flux) - a current needs to flow. As the current increases, the delta(flux) decreases, so does the d(flux)/dt and Vac. This decrease in Vac with increasing current is equivalent to a finite output impedance of the generator. If the output impedance is too high, the generator output voltage Vac will drop too quickly with the increasing current. That is not desirable, because any appliance run by the generator will be dissipating much less power (Vac^2/(2*R)) than it needs to - e.g., a filament lamp will glow very dimly, etc. In that case, one remedy can be connecting a number of the AC batteries in parallel. First of all, one can create multiple AC batteries around a single rotating disc. Also, the disc is moving freely (except for the power transfer related retardation exerted by the magnetic field in the air gap region), and not touching any part of the magnetic loops, unlike the brush-slipring contact in generators (e.g., the schematic in https://en.wikipedia.org/wiki/Single-phase_generator﻿). Another very important advantage relates to the fact that multiple ferromagnetic strips placed on the periphery of the disc give an effective speed gain over conventional generators. In a single phase conventional generator, one revolution of the armature gives rise to one AC cycle, so, in order to produce 60 Hz AC, one needs 3600 RPM of the shaft/armature. But, in the case of a disc with 60 strips on the periphery, only 60 RPM is needed. So, the disc is very well suited for a Windmill, that can avoid much of the speed augmentation through gear ratios. Another interesting advantage is that when the speed of the disc falls (in spite of the pawl based power transfer, and a VMI flywheel as indicated in Item#447), one can electronically sense the falling Vac, and automatically select a higher number of turns (N), so that the Vac is stabilized to some extent. It's like the auto transmission in a motor vehicle. Obviously, in its simplest form, the generator is rather cheap to build - it's like a transformer with only the secondary coil, and the disc that is shared by a number of such loops has a bunch of small ferromagnetic cylinders on its periphery. Note that as the disc (could be powered by a windmill) rotates, the reluctance of the airgap is alternately high and low - this modulates the flux in the core, giving rise to Ac emf. As per Lenz's law, Vac = - N * d(flux)/dt, where N is number of turns in the coil. Obviously, a number of such generators can simultaneously work out of a single disc. An interesting thing to note is that Vac depends on d(flux)/dt, so a smaller flux with higher speed disc can give reasonable output voltage. That means, a weaker permanent magnet or electromagnet can suffice if the speed of the disc is high. If a ferro strip thickness of 2cm is moving through an air gap of 2.2cm, with 1mm gaps above and below the strip, one gets a maximum reluctance ratio of roughly 11, between when the ferro strip completely covers the gap and when it is completely off. Since the air gap reluctance dominates the overall loop reluctance (due to high relative permeability of the ferro core), the max flux ratio between the ferro strip and nonmagnetic strip is roughly 11 too (probably less due to losses). That's the delta(flux). If the delta(flux) is a linear function of time (ramp up and down), one expects a square wave output as the Vac, if the delta(flux) varies as the square of time, one expects triangular Vac waveform. If the delta(flux) can be made to vary as cosine of time by properly shaping the magnetic terminals of the air gap, one expects a sine wave as Vac. Please, note the crucial waveforms in the top panel. Note how the 30 Hz clkoutinv1 and the clkoutbarinv1 cross each other at around the |Vth0| of the PMOSes. Because of the coupling between the primary coils, the v(p1) and v(p2) both go up and down together at 60 Hz, although one of the two PMOSes is off depending on the input levels of clkoutinv1 and the clkoutbarinv1﻿. The quality of the AC produced is seen to good with >25dB separation between the signal peak and the nearest harmonic peak. Please, note that the circuit works on a 2V dc supply, and produces a 2.8V AC at 60 Hz. But, in reality, probably a 12V (or more) dc supply would be converted to 110V AC. In order to do that, the output PMOS fets (connected to the transformer) would have to be 12V (or more) tolerant with higher Vth0 - and, their inputs clkoutinv1 and clkoutbarinv1 have to be first adequately transformed up before feeding to the gates. So, the good thing about the circuit is that while output circuit works on a 12V (or more) dc supply, the input control circuit can still work on a low voltage - drawing less power. The simulation results will be shown in the next Item. Typically the windmill gear boxes use the planetary gears for stronger meshing with the rotor input (10-60 rpm). But, the minimal design shown in Item#447 uses just a bevel gears meshing. The following diagram shows how to improve the quality of meshing, and avoid increasing backlash/disengagement over time. Note that the spring loaded shaft section presses the horizontal bevel against the vertical one at all times. It also works as a shock absorber. 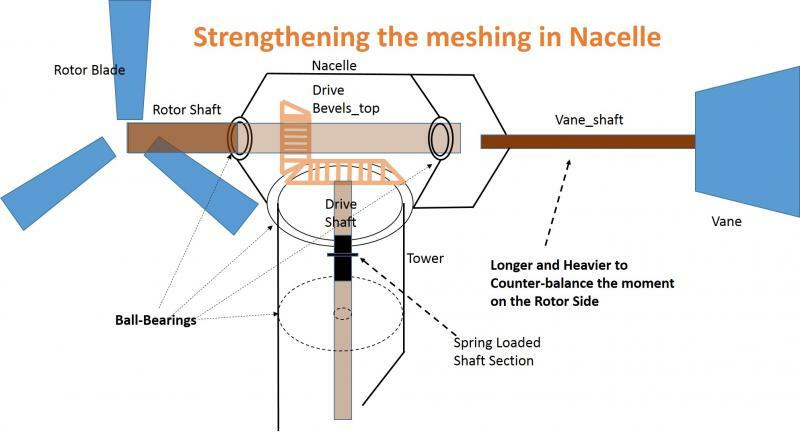 The rotor shaft extending to another bearing at the back of the Nacelle helps transfer all the load fluctuations to the Nacelle which is now kept in place by the counter moment of the longer and heavier vane shaft. 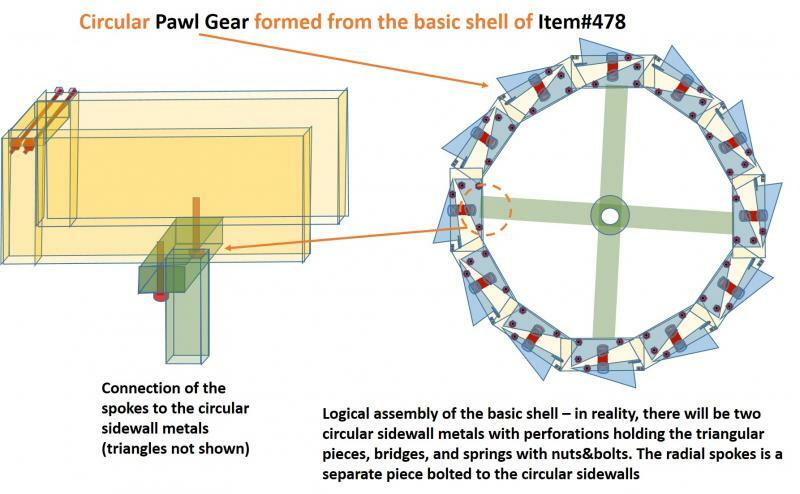 One interesting aspect of introducing the pawl gear as in Item#447 is that it divides the windmill transmission into two parts - the driver side (rotor to pawl) and the driven side (beyond the pawl). So, one can have various driven sides depending on the needs. The driven side could be a generator with varying rotor speed requirements, the flywheel of a boat as in Item#394 looking for wind assist, or even a water pump, etc. 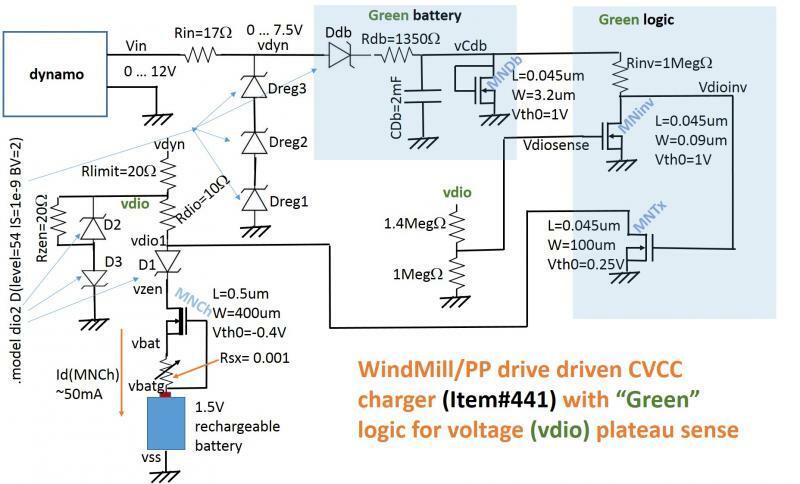 The low cost charger design shown in Item#445 can make power generation with Windmills more appealing - creating new interst in windmills. Of course, the charger can also go with the PP drive, but, that's mainly for emergency charging, or the charging of smaller batteries. But, with windmills one can generate serious power. 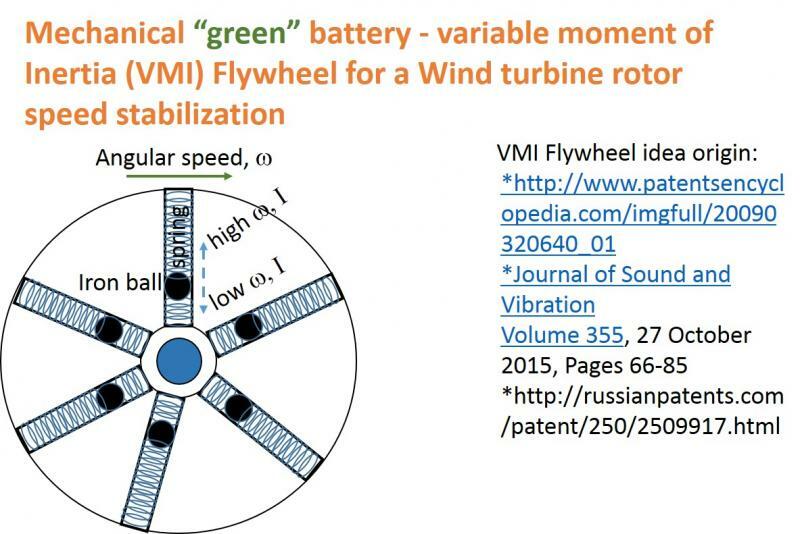 So, we discuss a minimal windmill design that incorporates pawl based power transfer (see Item#392) and generator rotor speed stabilization﻿ using a variable moment of inertia (VMI) flywheel. The latter works with the centrifugal force to increase the moment of inertia (I) as the rotational speed of the flywheel tends to increase, thus preventing excessive speed. Again, when the kinetic energy (0.5*I*omega^2) of the flywheel decreases, the I reduces to prevent the angular speed from falling too quickly. This way the flywheel helps keep the angular speed in a narrow range. So, the flywheel tends to store the kinetic rotational energy as if like a "green" battery that delivers a near constant speed. Also, it must be placed in a horizontal plane when applied to the WindMill's power transmission - otherwise gravity will make its motion wobbly. The important advantage of the pawl based power transfer is that it prevents a slow moving (lower energy) or stationary windmill from becoming a load to the portion of the transmission beyond the pawl. Also, that the windmill can be applied in an assist mode as with the boat of the Item#394. The other important feature of this minimal design is that the Nacelle does not include the transmission and generator, unlike as in the typical windmills. Since the windmill is not head-heavy, the vane can respond more efficiently. a 400mF cap is chosen this time in place of the 140mF cap used in Item#445. Should take longer to charge up. Please note the potential divider and an NMOS added at the bottom to prevent the battery voltage from going above 1.55V or so. Again, the circuit is simulated with the battery replaced with a 140mF Capacitor as in Item#444. The max power consumed by the charger circuit is <1.7W. So, a number of such circuits can work in parallel with the help of a single "green" battery. which consumes <4mA in this circuit. Charging current can be increased further by reducing the Vth0 of the depletion MOS. 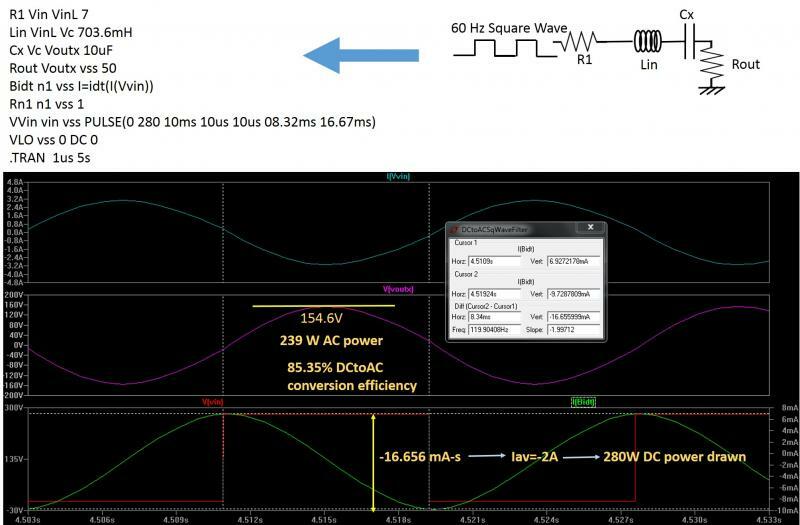 A Vth0 of -0.65V can give 100mA etc. Note that at around 3.23s, the battery reaches a voltage level of 1.5V. Beyond that is overcharge. So, a circuit similar to the one for plateau sense (Item#442) is needed to cut off charging as the vbatg level reaches 1.55V or so (slightly above 1.5V). This circuit should sense the "vbatg" rather than the "vdio" as was done for plaeau sense. The 140mF cap is just a convenient number that enables chargeup in a short simulation time interval. In reality, charging times will be much longer. 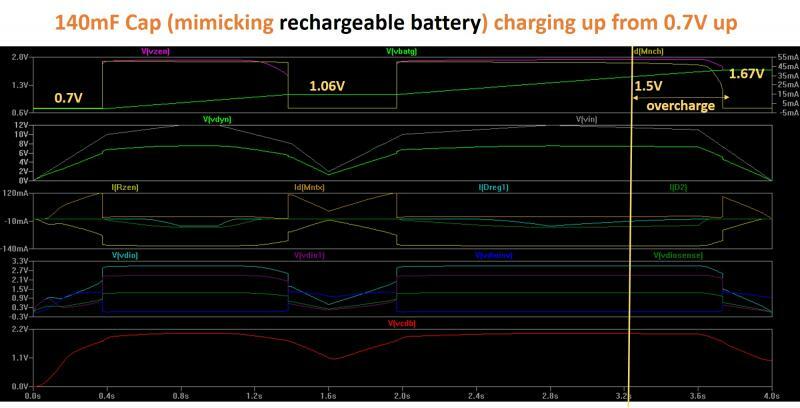 Note that when the charger is not charging the rechargeable battery, the V(vzen) [third pane from the top] simply reflects the current potential state of the battery (0.7V, 0.8V ... 1.5V). At that time, D1 is off - preventing any leakage from the battery receiving the charge. 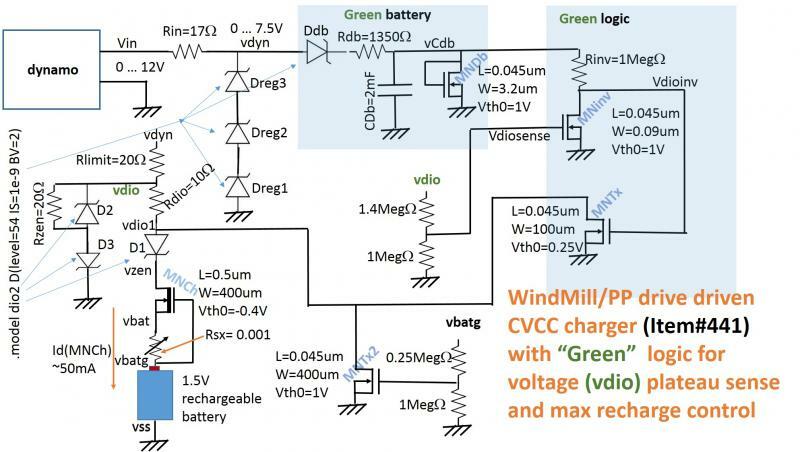 As indidated in Item#441 some "green" logic has been added to make sure that the CVCC charger charges the battery only when the dynamo produces reasonable (above a threshold) voltage. The dynamo is assumed to produce dc voltage in the range of 0 to 12V. The trio of series regulator zener diodes (Dreg1, Dreg2, Dreg3) help limit the charger input voltage (vdyn) to 7.5V max. The "green" battery consists of a diode and a resistor for charge supply, and a gate-drain connected enhancement NMOS for charge drainage - the 2mF cap stores the charge. The supply and the drainage rates are equated to get a plateau battery voltage level of ~2V (Vcdb). The dynamic battery drives the resistive loaded NMOS inverter to invert the potential divided vdio. 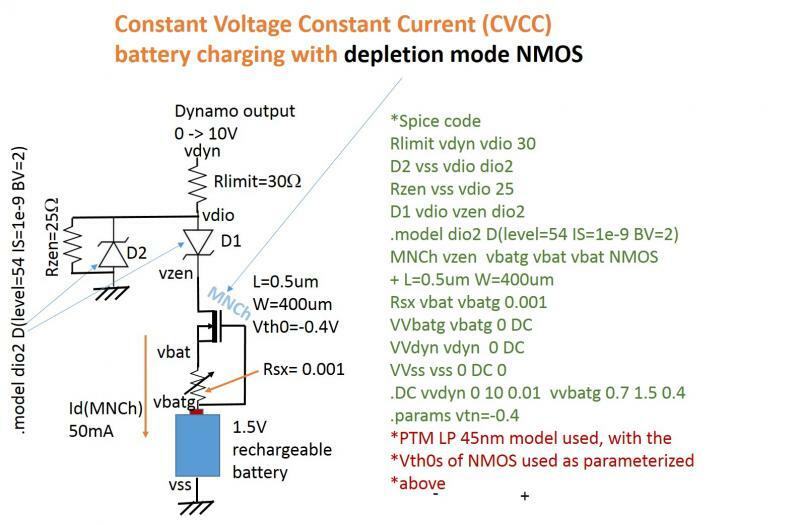 When the vdiosense goes above 1V (Vth0 of the NMOS), it means the vdio has now been regulated (plateau) for charging - a "0" on vdioinv cuts off the low Vth0 (0.25V) bottom NMOS to enable charging through vdio1. For lower (unregulated) vdio potentials, the vdioinv is a "1", although its voltage level may be a bit lower depending on the current weaker Vcdb level. 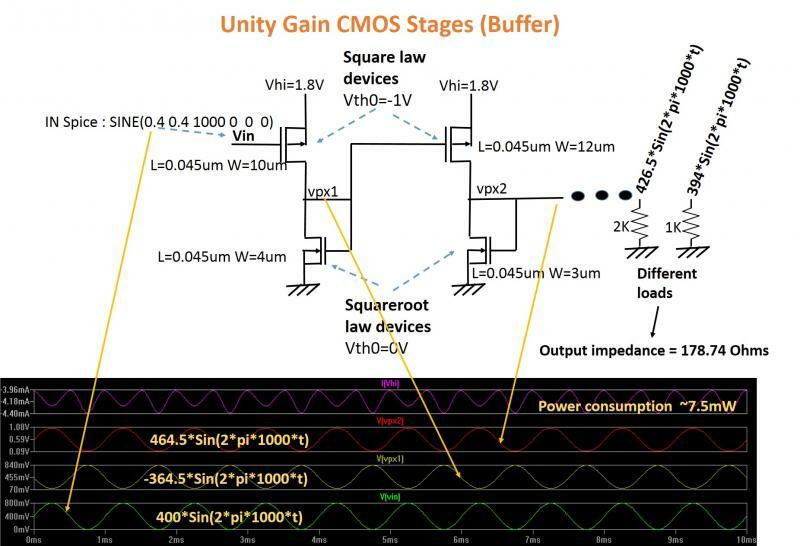 That's why a lower Vth0 is chosen for the bottom NMOS, to make sure that even for a weaker "1" the fet remains shorted, and the vdio1 leaks through it, disabling charging. Note the introduction of an addtional voltage drop through D3 to account for the small Rdio drop that was needed to leak away vdio1 under logic control. The D3 addition needs the top resistor of the potential divider getting raised to 1.4Meg. 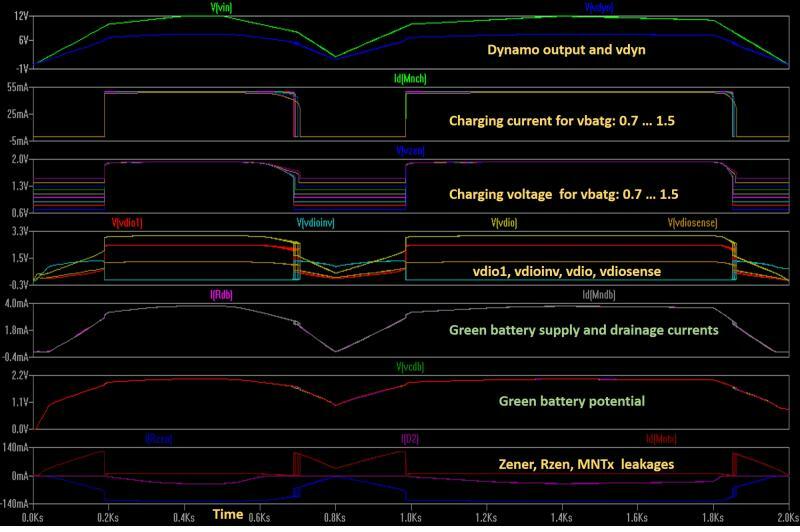 Without the D3, there would be a spread in the charging current and voltage [Id(MNCh), V(vzen)], with the rechargeable battery voltage going from 0.7V through 1.5V. The simulation is shown in the next Item. As indicated in the last section of Item#440, the aim is to bring down the dynamo output voltage requirement for ~50mA charging current. Preferably under 12V so that the charger could even work from a car battery. This can be accomplished with the following edited circuit - which basically involves moving the left zener up from the cathode to the anode of the top zener, and adding a shunt resistance (25 Ohms) to it. Also, the Rlimit is reduced from 500 to 30. These edits have beneficial attributes as we discuss below. Note that the various currents and voltages are indicated on the simulation panes for charging at a dynamo output of 8V. The shunt resistance Rzen dissipates about 250mW (2.5Vx100mA) that could alternatively be used to power an LED lamp while the charging is in progress, or even without charging. A half watt zener can take up to 200mA at 2.5V, so 32mA is safe. In fact, the shunt resistance can be further reduced to protect the zener if needed to handle a higher dynamo output. The Rsx is set to 1 milliOhm to enable maximum charge current (50mA) for this config. Please note that the numbers used in this example are not to be thought of as etched in stone - they just exemplify the charger principle. One needs to ensure that the charging takes place only during the plateau region (>~6.7V of the dynamo output) of the Id(MNCh) so that proper CVCC takes place. Also, to switch off charging when the battery gets fully charged - otherwise overcharging damage can occur. In order to achieve that, some 'green' (powered by the dynamo output only) logic is needed. The circuit is simulated for Rsx = 1 ohm and Rsx = 15 ohms. Higher Rsx gives lower charging current. The good thing about this charger is that it can always remain connected to the dynamo run by a PP drive or a WindMill, with the battery in place - because there is no leakage through the charging NMOS even if no charging is taking place. 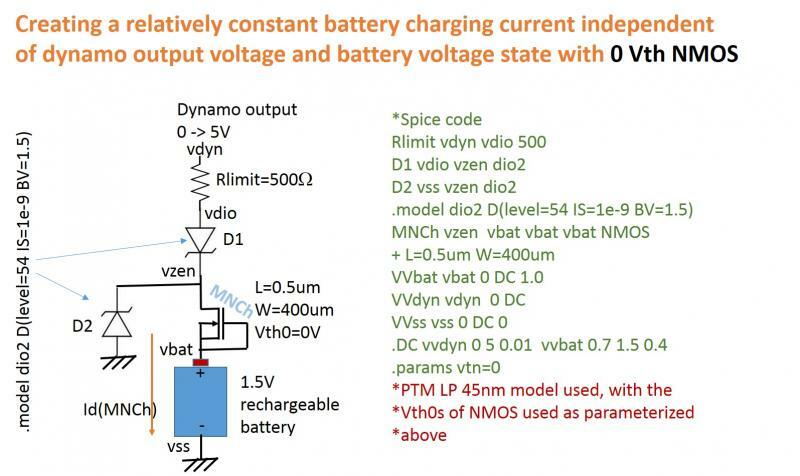 We can see that for a higher charging current, the dynamo output needs to be above 25V. Of course, it is possible to apply an appropriate transformer to an alternator output, before rectification, but it is desirable to be able to charge from a lower dynamo output. So that the active charging voltage range starts low. This will be discussed in the next Item. Please, note that the Item#438 only introduces a simple principle for constant voltage constant current (CVCC) charging. The small charging current of ~1mA is often too little for practical rechargeable 1.5V batteries with a capacity of >2000mAh (see under "AA battery" in wikipedia). The charging current can be increased by using a depletion NMOS (-ve Vth0) instead of the 0 Vth0 NMOS used. For example, using a Vth0 of -0.2V, one can get a charging current of 15mA. But, this will need higher dynamo output voltage, >10V. Is that reasonable to expect from the dynamo? Dynamos often come with a conversion (mechanical to electrical) efficiency between 50% and 95% (see for example, https://www.quora.com/Whats-the-reasonable-electrical-efficiency-that-can-be-expected-from-a-dynamo﻿). Since the foot-pushed PP drive can deliver more mechanical power than a traditional bike (Item#s 435, 436), one can expect to get >100W of mechanical power from the PP drive driven with strength. But, if we assume a very conservative number of 30 ft-lbs/sec (see the scooter example of Item#396) - that amounts to roughly 40 Watts of mechanical power, and assuming a 50% efficiency of the dynamo, one gets about 20W of electrical power out of the dynamo. 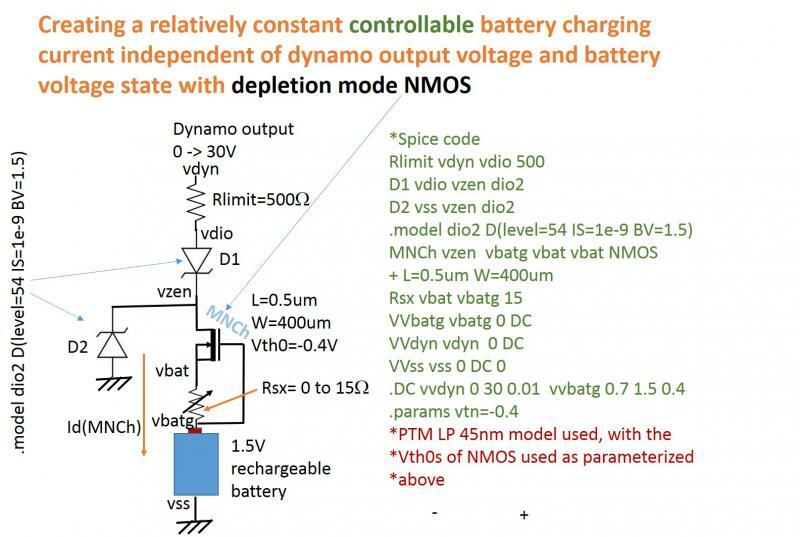 Now, let's assume that we are using the depletion NMOS with a Vth0 of -0.2V, as indicated above, and the dynamo is giving out 12V. So, the net power consumed in the 15mA charging is only about 12*20 = 240 mW. [20mA net current is a sum of the charging current and the left zener current at 12V]. That's an extremely small fraction of the dynamo Watts being consumed by the charger circuit. This indicates that one can go for faster charging with even higher currents. Let's assume (somewhat hypothetically) that the dynamo output voltage can vary from 0 to 5V. The following circuit tries to maintain a relatively constant charging current over the active (above a certain threshold) voltage range, as well as with growing (charging up) battery potential. The circuit takes advantage of the 0 Vth NMOS's (frequently used with the earlier analog circuits) saturation current with its gate and source shorted - to supply a ~1mA charging current. The Zener regulation starts around 2.7V. Had the NMOS been replaced with a resistor, the charging current would change widely with the battery voltage build-up. The same would be the case if the NMOS had its gate shorted to the drain, instead of to its source - this motivates the 0 Vth0 NMOS. Obviously, a slow moving dynamo will not contribute to the charging - corresponds to a vvdyn range where the Id(MNCh)=0. While the left zener diode is used for voltage regulation, both diodes help prevent the NMOS from leaking any current (current flowing upwards). Item#437> Can the PP drive be operated by a person with a physical handicap? Yes, because one can push/pull the PP drive in various ways. With one hand, or with one leg, or even with the torso (sitting on a chair that can roll back and forth on rails). Obviously, in the horizontal position you lose the gravity advantage. 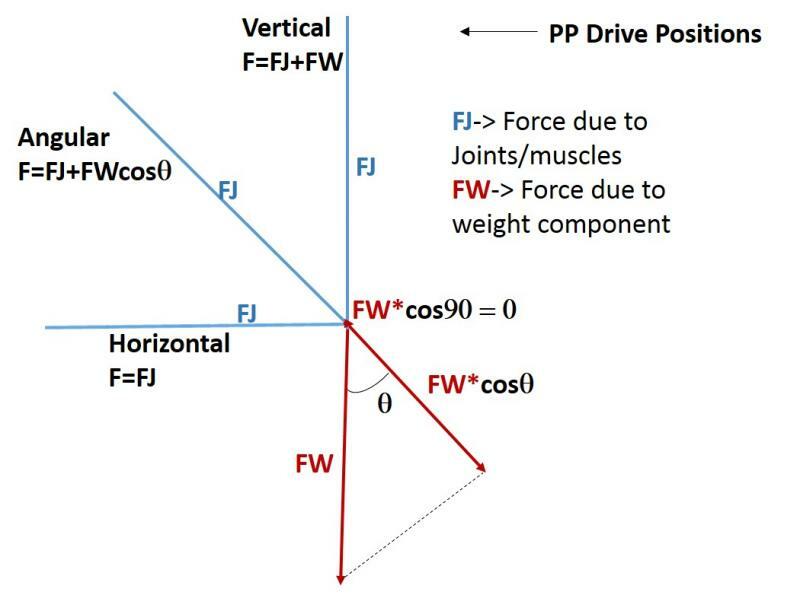 But, the force diagram motivates the thought - if we could increase the FW, we would be able to inject more energy per push! Yes, we can - if the PP drive is made to hang from a ceiling, and we pull it in the active mode, instead of pushing. A much larger FW is possible that way. Please note that the effort comparison is similar to that between walking/running versus skateboarding, both of which depend on "indirect" reaction force of friction with the ground. 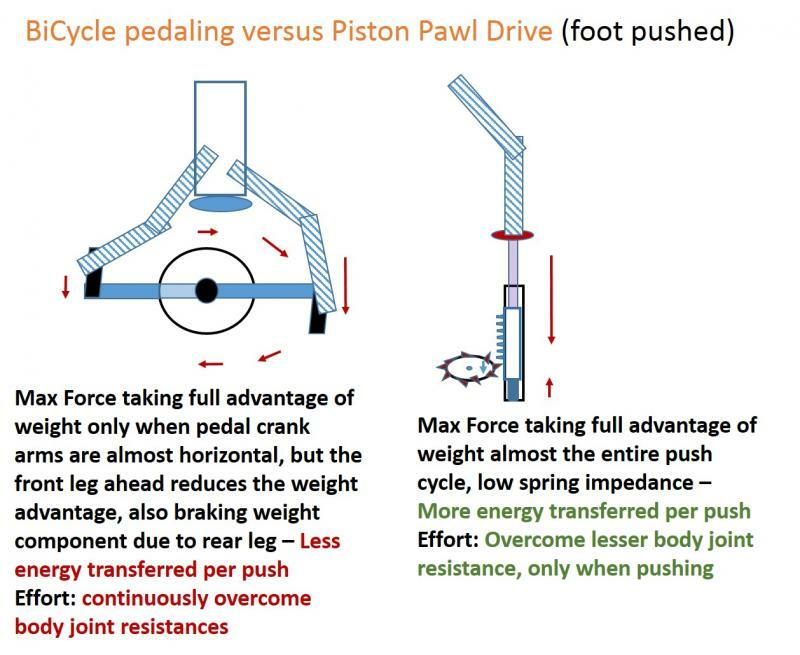 Ground friction is a much weaker force compared to the direct pushes involved in bicycles or in piston-pawl drives. While walking there is an inherent braking effect at every step due to the rear end of the foot. The friction due to the front edge of the foot gives the forward drive. It is nature's design for a stable movement - integrating the braking with the forward drive - making the speed slower. Sort of like a negative feedback amplifier that gives a more stable, but lower gain. In bicyles, however, there is an unintended braking effect due to an weight component of the rear leg - it counteracts the forward moment - there is no such braking effect in a skateboard. In the PP drive, there is an unavoidable impedance due to the spring - but, this impedance is low since the spring needs to have a low spring constant to lift the piston in the no-load direction (upwards). In a sense, the piston-pawl drive adapts to a planet with gravity - like the solar cell adapting to sunshine. 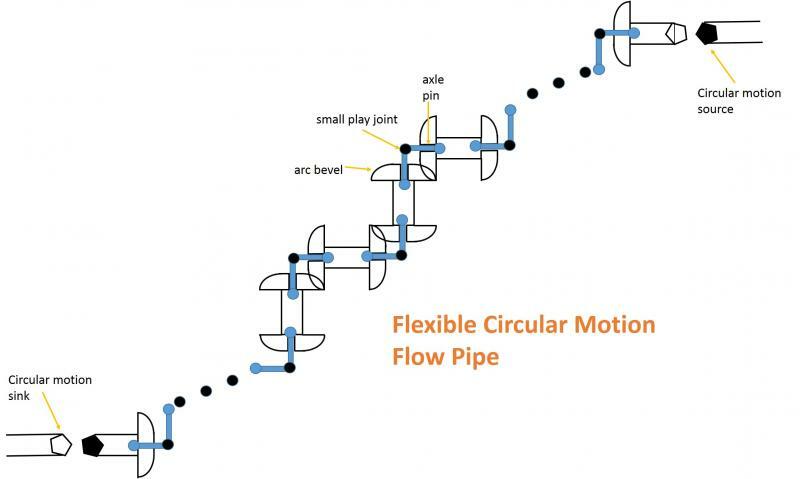 If there can be a flexible rubber tube for water flow, a flexible wire for electricity flow, can there be a flexible pipe for circular motion flow? The small play joint can be tightened with a nut and a bolt to keep the adjacent axle pins close to perpendicular to one another, but making sure that the corresponding bevels are in mesh. Note that the bevel dumbbells can be rotated to stay at a different plane with respect to adjacent sections - giving the structure its flexibility. Another interesting feature is that one can take out sections of the "pipe" quite easily by unscrewing off the nuts and bolts - making the "pipe" shorter. Or, even add sections to make it longer. Also, bifurcation is possible by adding a third axle pin to a joint, and then adding a sub-section to the bifurcated dumbbell, like in the case of the shift register maze of Item#257. Each bevel dumbbell is like a shift stage - drawing a parallel with digital electronics. The piston-pawl drive discussed earlier represents a leap in the conversion of reciprocatory motion to circular motion in a compact framework. It can easily be seen that the rotary motion could also be genenerated by spring-toothing the piston rack (front and back) instead of using the pawl gears, which then could be replaced by regular pinions. The basic innovation involves bringing the pawl action from the load side (like in a bicycle rear wheel hub, where it has just a go/no-go role) to the drive side where its logical meaning can be more effectively utilized. Whenever a new gear mechanism is unearthed, many new applications come up, as we have discussed in some items between Item#372 and Item#396. They will revolutionize manually driven "green" transport - typically dominated by the bicycle, the oars driven boat, the cycle/hand-pulled rickshaw, etc. The push operation can take advantage of gravity. Also, due to ease of operation and much cheaper price, many users of motorized vehicles will switch to piston-pawl driven "green" vehicles. Because of its compact framework, the device can be used as a standalone rotary motion generator, sort of like a bicycle pump. Now, if an alternator and a rectifier are integrated into it, it can serve as a standalone power generator. A potential use can be that of a portable battery boost for your automobile. The foot operated piston-pawl battery booster can be stored in the back compartment of a car equipped with an electromech port (hole) near the accelerator pedal. When needed, push it into the port and work it with your foot while turning the car starting key. 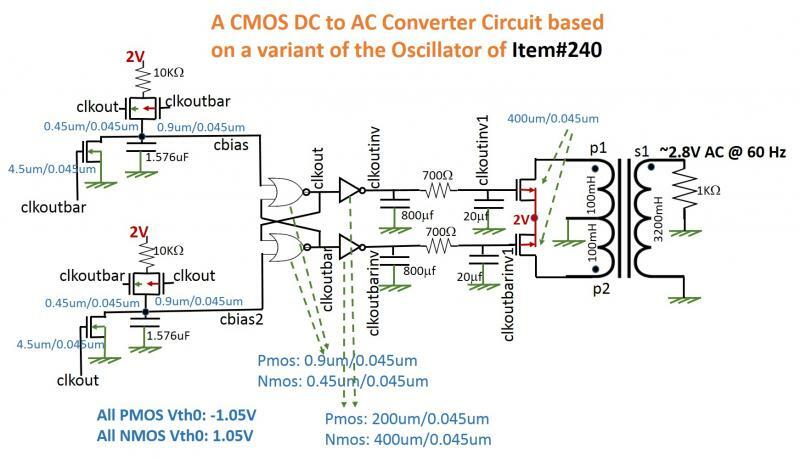 The method of CMOS analog design shown in this page is somewhat different from the published methods that typically work on the ideal nature of the MOSFETs used. Here, in contrast, the design adapts to the non-ideal nature of very short channel Fets. We recognize that the channel length modulation (Early effect), drain-induced barrier lowering (DIBL), punchthrough, etc. can lead to the linearity discussed in Item#415. In fact, some short channel effects are welcome - if they do not impact the digital functioning of the devices. Now, one needs to also point out that there is no guarantee that in another short channel process node the same linearity will be found by default, as is found with these PTM 45nm fets. So, this indicates the need for characterization (measurements) and some R&D to make sure that the linearity is available. 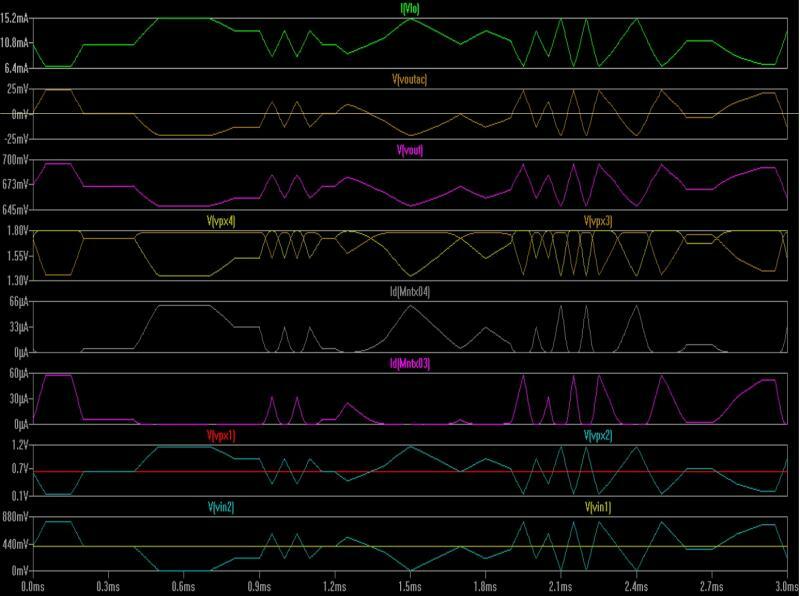 Process parameters such as source/drain junction depths, substrate concentration, and oxide thickness can be varied in short-loop runs to investigate the best combination for linearity. The other interesting aspect of these designs relates to exercising the various process options available in the modern low feature size CMOS processes. 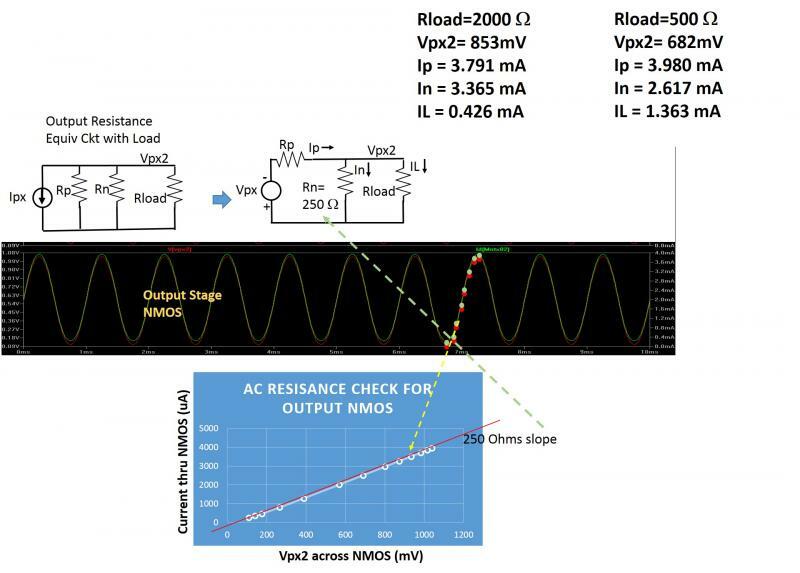 Frequent use of the deep Nwell, the feature of threshold voltage tailoring to 0/1V for NMOS, and -1/0V for PMOS represent a methodology that also adapts to the process options. Note the temperature sensed voltage vpp from the Temp Sensor in the top panel below. Obviously, the temperature compensation is not perfect. But, considerable improvement occurs after including the temperature correction circuit in the simulation. 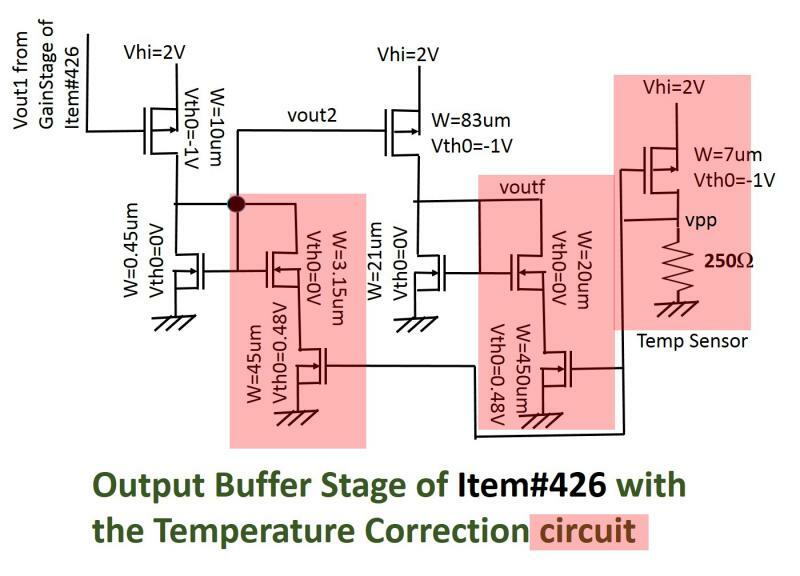 The large W values for the temperature control fets (Vth0=0.48V) are needed to account for the fact that these two fets are being operated near their cutoff. The 200mV spread in the sensor output indicates sizeable temperature sensitivity of these fets - does that mean that most published MOS analog circuits are some kind of temp sensors! Circuits designed with FinFETs can get worse with the self-heating issues of the latter - planar MOSFETs are cooler with the substrate more efficiently absorbing the heat. In Item#428 it was shown that by increasing the W values of the PMOSes (gain) in the output stage, one can get back the features in the output voltage profile. 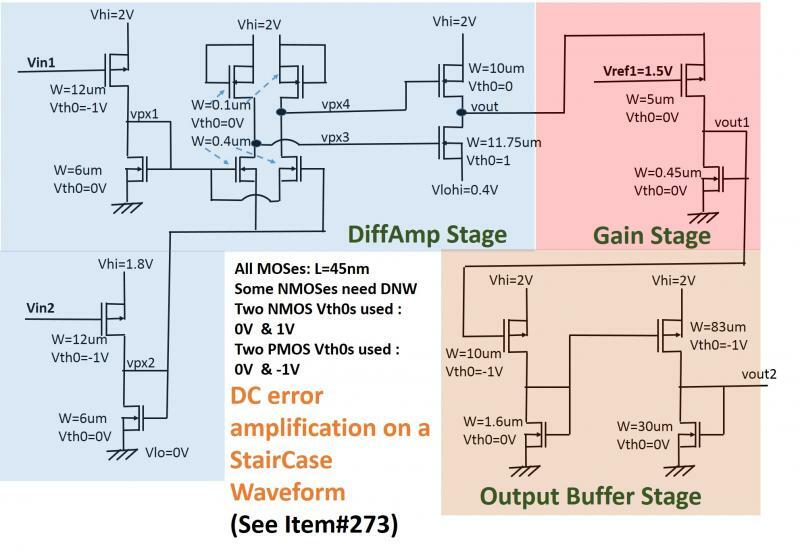 Instead, it is easier to effectively reduce the W values of the NMOS loads in the output buffer stage, in response to the increasing temperatures. Note how the load NMOSes have been split into two fets each - one part working as before, equally at all temperatures, and the other goes from ON to OFF as the temps rise. 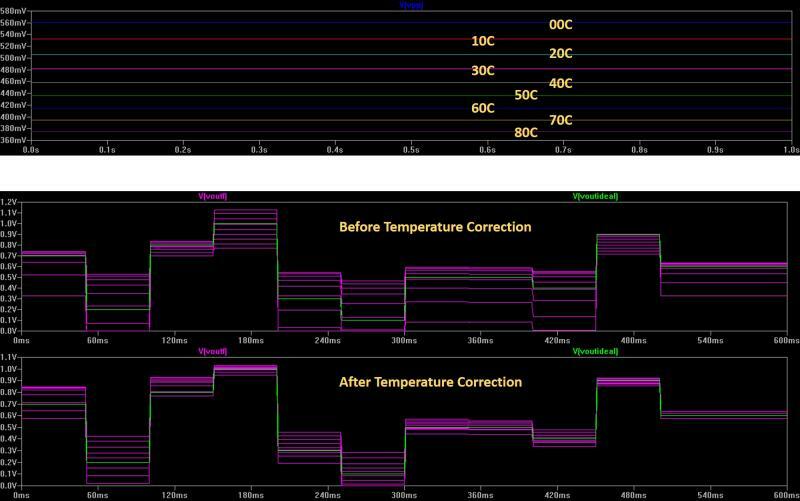 The Temp sensor delivers a progressively lower vpp with increasing temps - this will take the split load control NMOSes (Vth0=0.48V) from ON towards OFF, increasing its resistance along the way. Please, note that in the above simulations nothing else in the circuit was moved/changed - only the W values of the PMOSes in the output stage. So, a temperature compensate scheme could involve increasing these W's progressively (or in steps) with temperature. Again, the accuracy of the above results is dependent on the accuracy of the temperature sensitivity of the PTM model used. Please note that unlike with the traditional diffamp used in Item#273, no negative bias nor current mirroring is used in the following implementation. In Item#273, the gain achieved was <10. In the current implementation a gain of 10 is achieved, and the ideal 10-gain step waveform (see top pane) matches the output reasonably well. 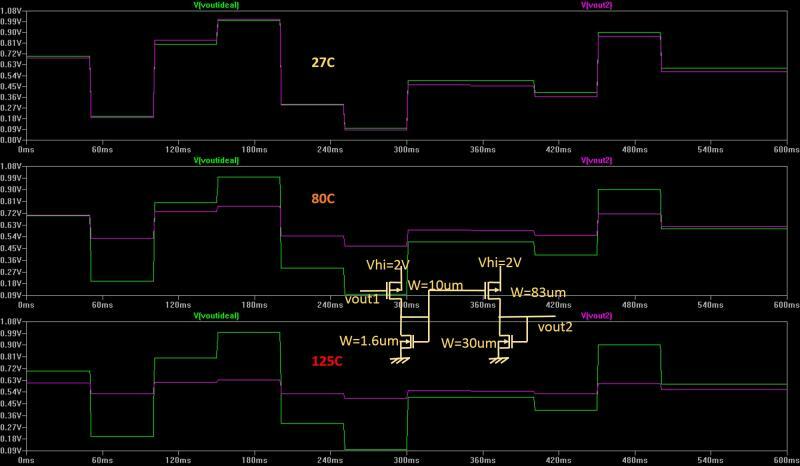 The reference voltage vref1 (1.5V) used in the simulation can be easily obtained using a simple potential divider consisting of two series connected resistors across vdd (2V), or even two series connected MOSfets. 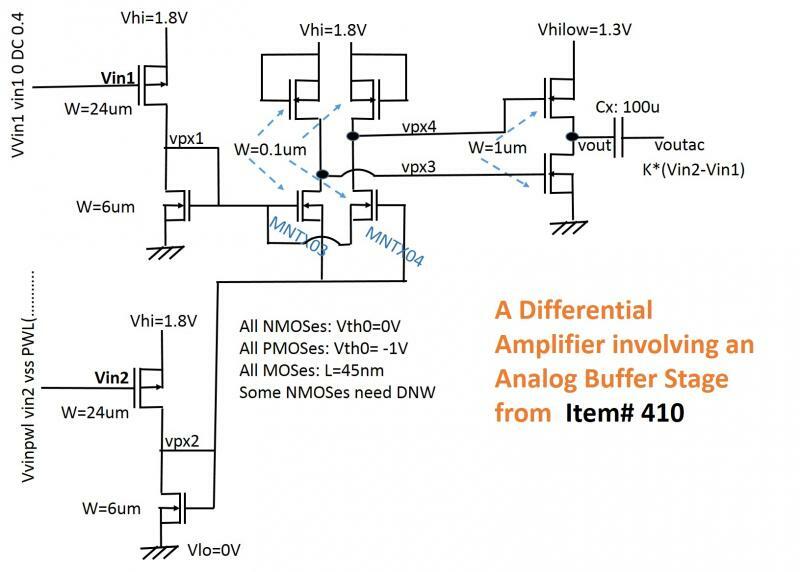 Since the vref1 drives the gate of a PMOS, the potential divider resistances can be high. 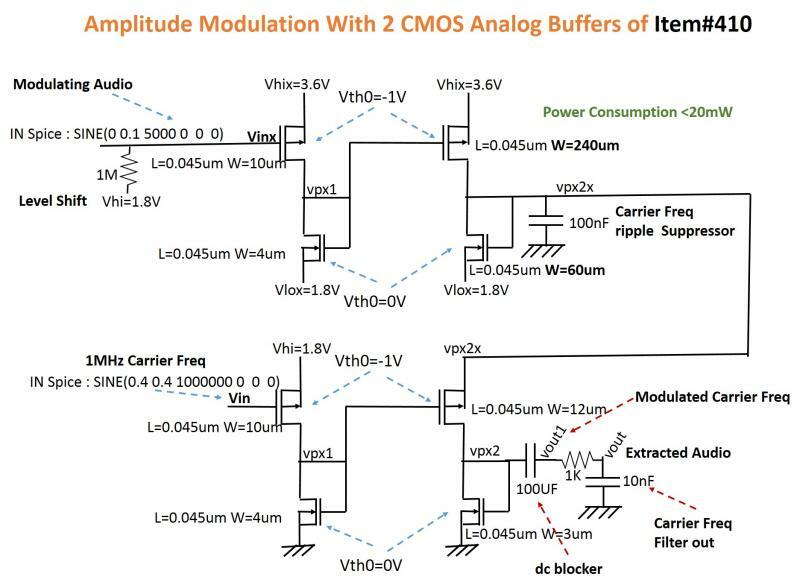 But, the other reference voltage Vlohi (0.4V) dives the source of an NMOS - so, it needs to have a low output impedance, must come from a stable voltage reference circuit. The circuit is designed for optimum operation at room temperature (27C), like any other circuits. For accurate predictions at other temperatures, more accurate temperature sensitive models are needed. One thing to note is that each stage is operating as a potential divider, so the temperature dependence of the top fet is expected to cancel the temperature dependence of the bottom fet, to some extent. This will leave the nature of the intermediate outputs unaltered. But, their spreads will be impacted by temperature. 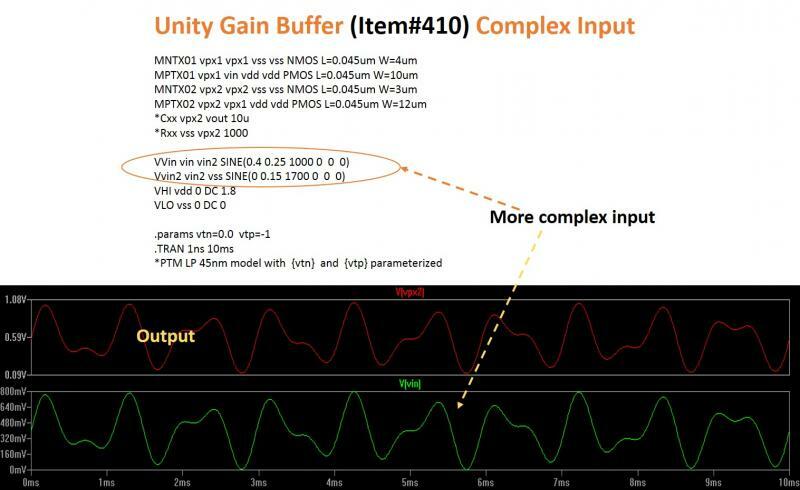 Although the diffAmp in Item#423 uses an output stage that has two NMOS fets operating in the linear region of operation, and the "vout" looks reasonable, deeper inspection can reveal that the vout versus vpx3/vpx4 is somewhat nonlinear. Also, the "vout" amplitude is rather small - which is, of course, not any big problem. Here, another more linear version of the output stage is being shown, that also exhibits much larger output swing. In this case, both fets operate in saturation, so the supply potential has been moved up to 1.8V. But, the lower Nfet needs to have a Vth0=1V. Also, its source is tied to 0.4V to give adequate play on Vpx3/Vpx4 from 1.8V to1.4V, while reducing gate drive asymmetry at vout midpoint. The top case (green curve) represents the situation when Vin2>Vin1 - hence the Vpx3 ramps down from 1.8V to 1.3V on the gate of the lower Nfet, with Vpx4=1.8V applied to the upper Nfet's gate. The bottom case represents Vin1>Vin2 - and the Vpx4 down ramp is on the top Nfet's gate. 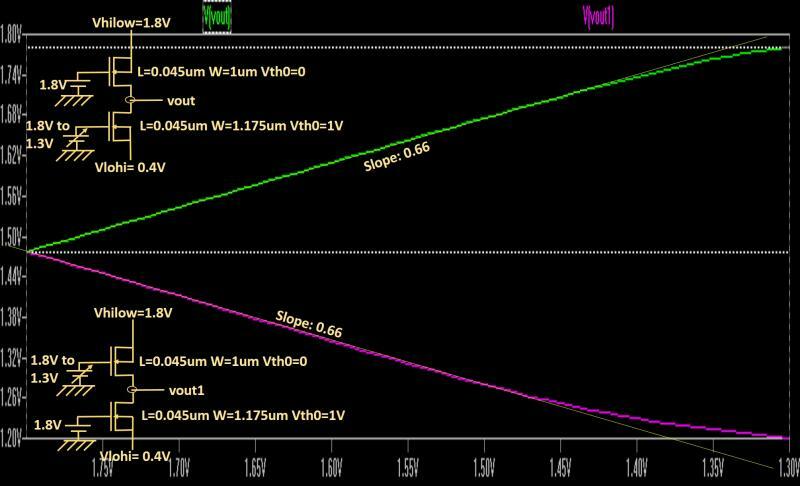 As is seen, the slopes for both cases match, and the linearity exists for a Vpx3/Vpx4 range of 1.8V through 1.45V (X-axis). Also, an output swing of >500mV (Y-axis) is available. Hence, while using this output stage with the diffAmp it is good to restrict the down swings on Vpx3/Vpx4 to above 1.45V. This can be achieved by lowering the gains on the input stage - e.g., reducing the W values of the input PMOS fets to 12um from 24um does it. Please, note that the goal of the current circuit and its simulation is to demonstrate differenced output. 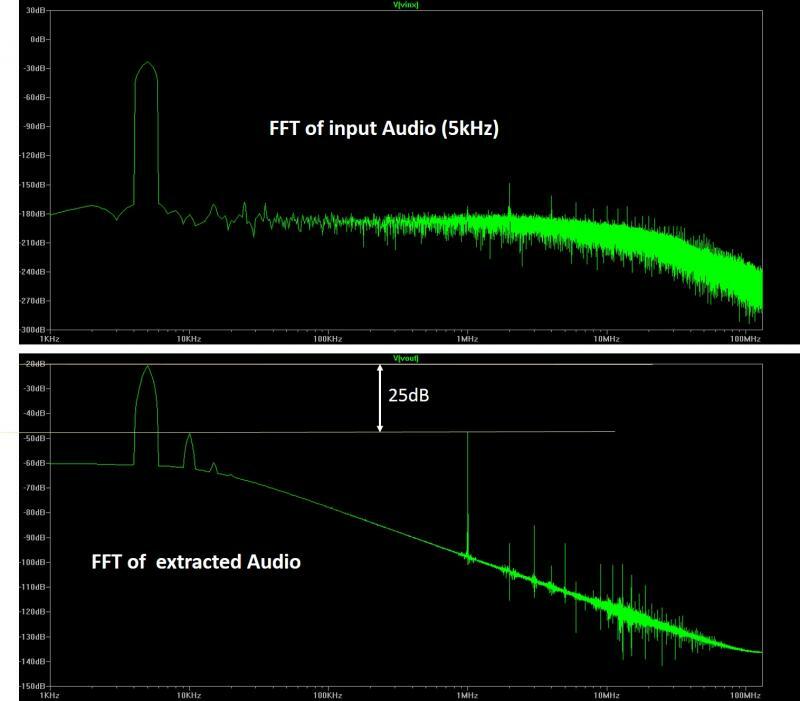 In order to achieve reasonable (low) output impedance and amplitude level (higher), gain buffer stages need to be added to the output. 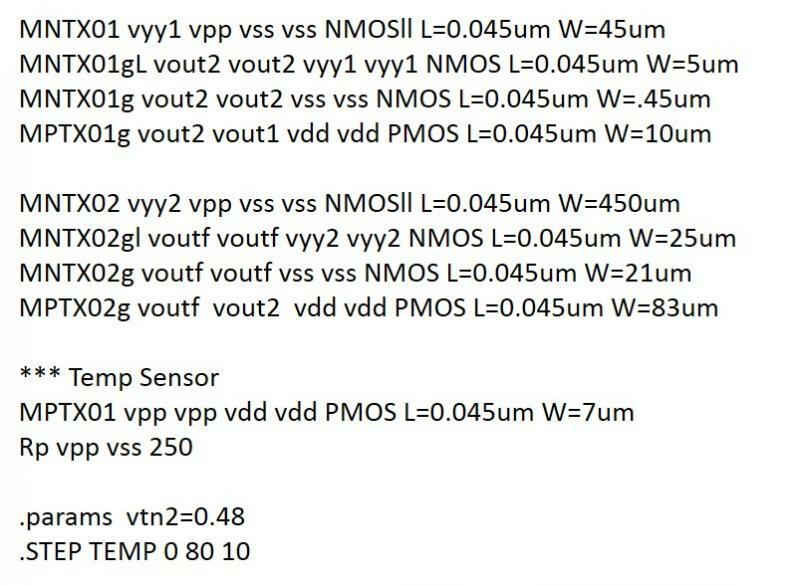 Since Vpx4 is getting applied to the top linear NMOS of the output stage, when Vin2>Vin1, the midpoint voltage "vout" is getting pulled towards the higher potential 1.3V. Similarly, the Vpx3 (when Vin1>Vin2) pulls the "vout" towards 0 using the lower NMOS's linear resistance. This gives rise to the differentiated output in synch with the Vin2-Vin1. The output stage is basically a gate controlled potential divider. Please, note that the power consumption (see top pane) is about 18mW. The circuit would still function, and at a much lower power consumption, if the W values for the fets in the output stage of the audio buffer are reduced proportionately, e.g., 60u for the Pfet, and 15u for the Nfet. The circuit has been simulated with W values of 240u and 60u respectively. 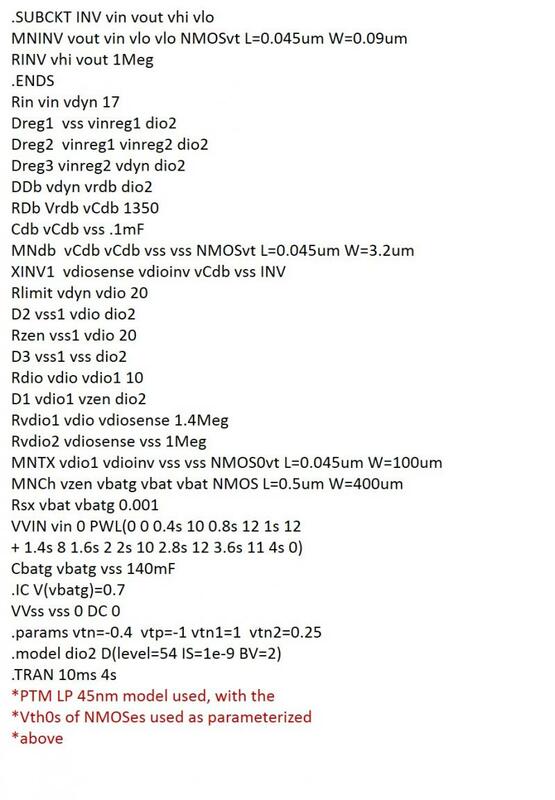 Note that the Gm of 0.0065 A/V is calculated from Ipx=4.733mA for Vpx1=728.67 mV (see Item#418). The equivalent circuit is valid for Vpx1 between 0 and 800mV. While the trends are matching, there is some noticeable underestimation (~20mV), particularly at Vin=400mV. This can be reduced for a particular load value by choosing an appropriate (higher) Gm, in place of the 0.0065 A/V used in the calculations. Please, note that this approach (using the top equation above) overestimates Voc by 5mV (from simulation measured 929 mV). This approach (using the Thevenin equivalent) gives a closer match on Voc. One interesting point to note is that the Thevenin voltage source (Vpx in Item#417) value of 4291.9 mV has no physical meaning - just a transformational entity. So is also the current through the parallel Rp in the Norton's equivalent. 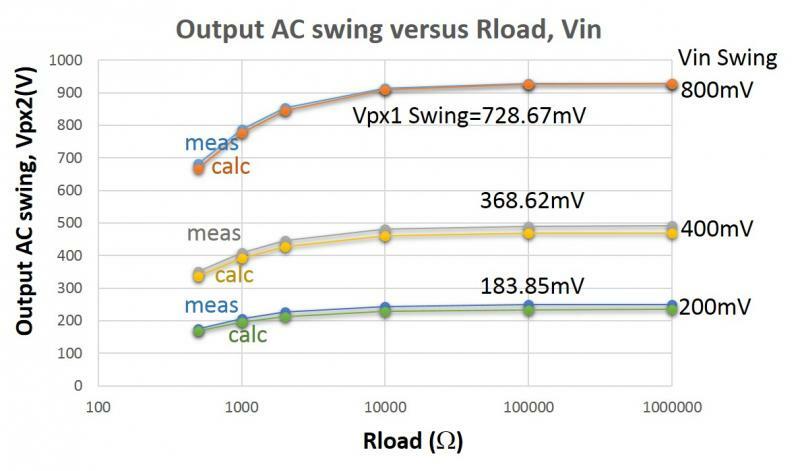 with its input (vpx1) coming from the first stage, source tied to Vdd, and drain tied to Voffset, I get a current swing of 4.8mA, this is close 4.733mA computed above. 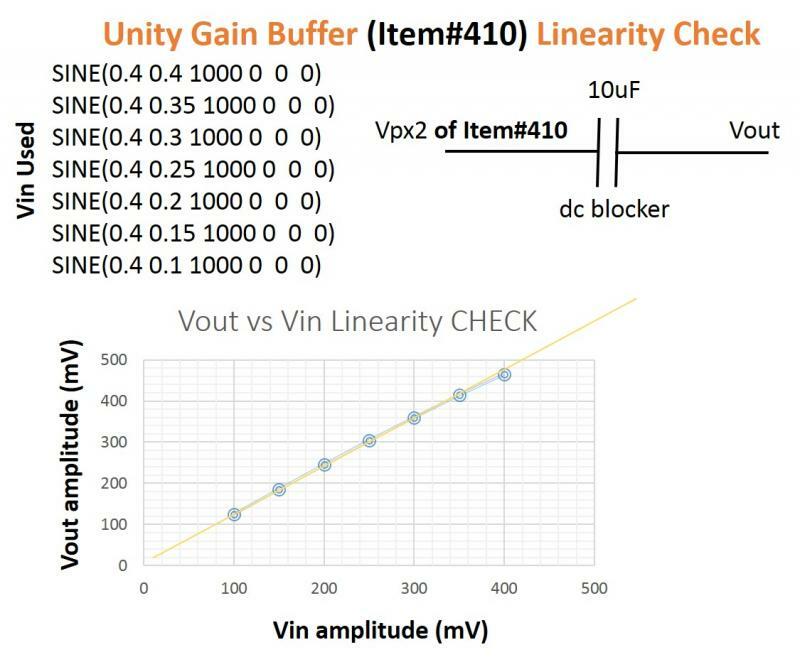 The Voffset is the lowest voltage the PMOS swings to (~110mV), and it comes from the Vpx2 curve in Item#410. Why does the offset happen? All the voltage points on the Vpx2 curve are obtained by intersecting the Ids-Vds curves of the NMOS and the PMOS at various Vpx1 points. Since the same current must flow through both fets. And, the current through the PMOS is not exactly 0 when the Vpx1 is 800mV. 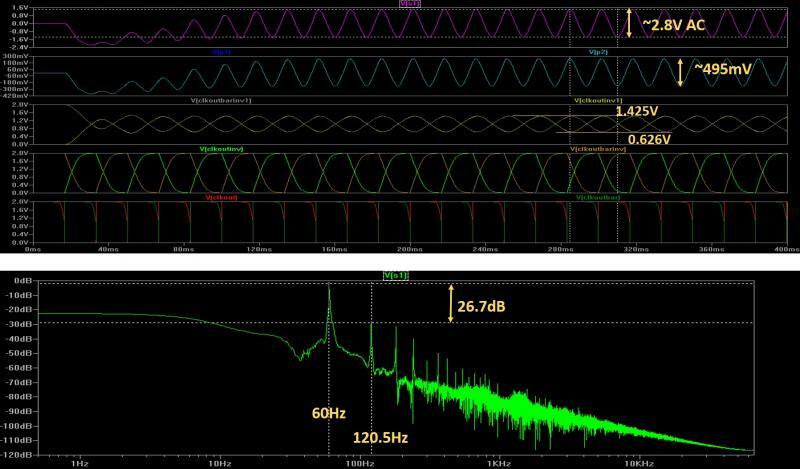 This non0 current when flowing through the NMOS creates the offset at Vpx2. One should not be too worried about the output impedance, because it can be easily controlled (brought down) through the relative aspect ratios in the output stage - as we see in Item#s 420,421. Please, note that the AC resistance is found by measuring from the simulation the instantaneous currents through and voltages across the output NMOS, and plotting them as shown above. 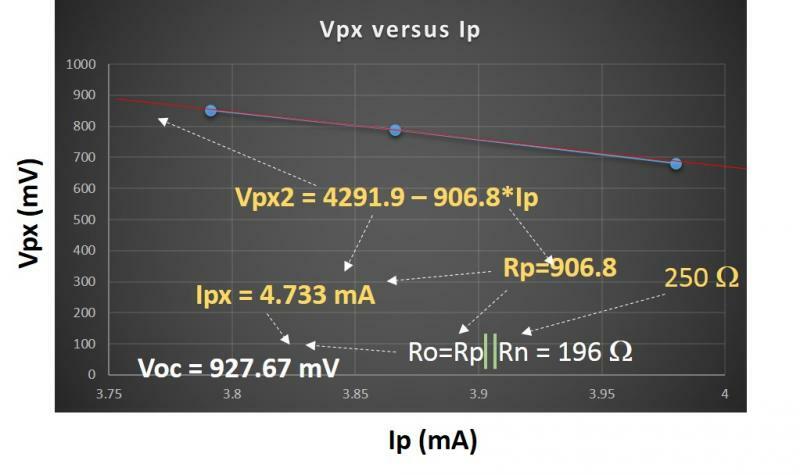 In order to find the Thevenin equiv voltage Vpx, and the Rp, I measure from the simulation the values of Vpx2, Ip, In, IL for two load R values - 2000 Ohms and 500 Ohms. All the voltages and currents measured indicate the ac swing (max to min) values, ignoring any dc components from superposition considerations. 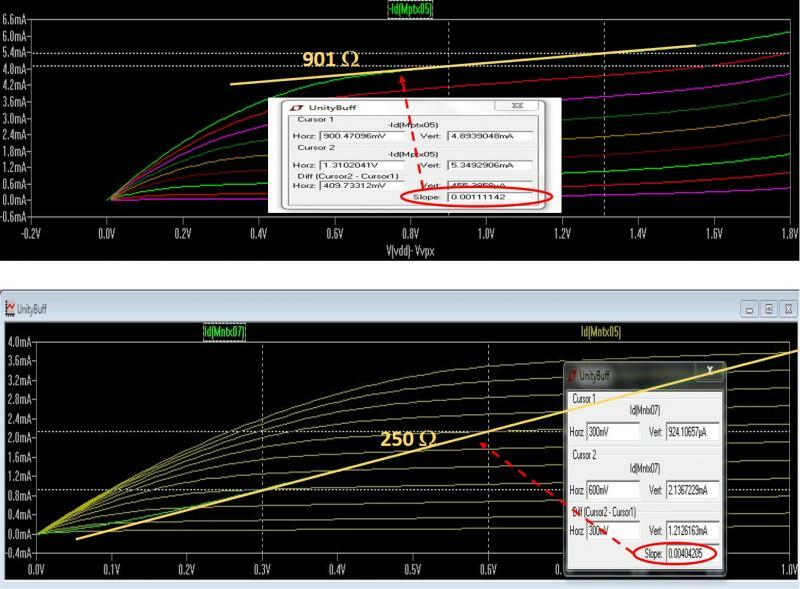 Rough checks: for Rload of 500, IL=682/500 =1.364 mA from Vpx2, In=682/250 =2.728 mA, etc. The match is not perfect but close. This value is somewhat higher than the 179 Ohms derived in Item#410, using Vpx2= Voc* Rload/(Rload+Ro), but, close. Can we get the values of Rp=~ 905 Rn=~250 from the dc Id-Vds measurements? Yes. Can we retrieve the Voc (no Rload) and In using the Ipx, Ro, Rn as above? Let's see. From voltage swing measurements, Voc=929mV, In=3.696mA. 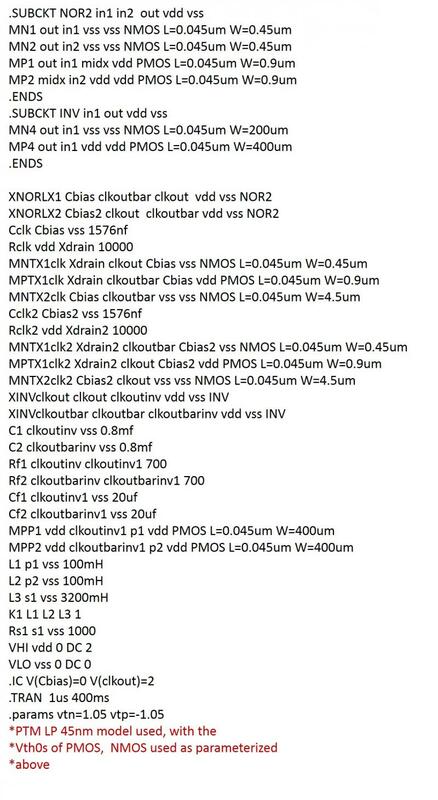 Using, Ipx and Ro, Voc= Ipx*Ro = 4.733*196 = 927.67 mV, In = 927.67/250 = 3.71mA; quite close. 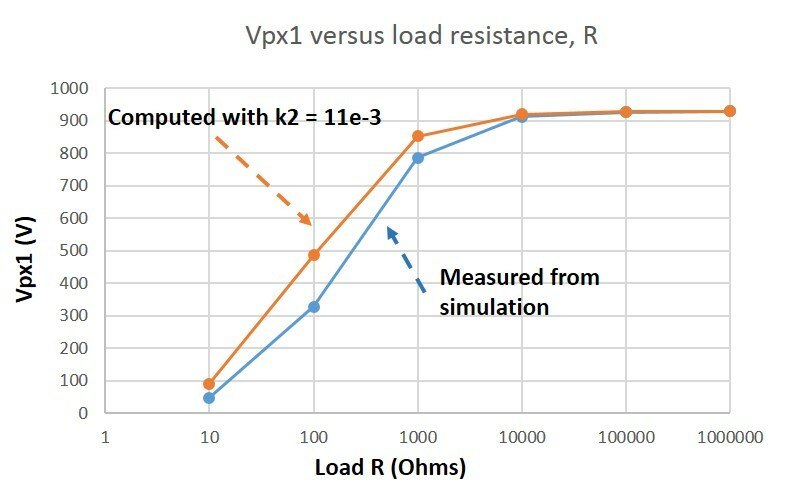 Since it is not easy to compute accurate k1 (actually, linear K1/2) and k2 (actually linear K2/2) in saturation for the short channel Fets used, the k1/k2 value is used from simulation measurement of (output swing/input swing). The k2 (actually, K2/2) value is used from Item#415's linear extraction. The discrepancy between the computed and the measured curves for lower R values would lessen if a more realistic saturation k2 was used, probably around 6e-3. So, this is an amplifier that takes advantage of the channel length modulation effect in short channel MOSFETs to achieve linearity over a large input signal span (compared to supply voltage) - small to large signal range. The ideal square law curve gets stretched like a rubber band to make it linear under the impact of short channel length modulaton - making the latter effect welcome in this case. In computing the ideal square law curve (NMOS), a K2/2 value of 11e-3 was used. This is just a rough number - used only to get a physical picture of the square law dependence that helps explain the "stretching". For example, if the K2 is extracted from the linear region of a 3um/0.045um NMOS, a value of 21.69e-3 (~22e-3) is found (see below). So, for a 4um/0.045um NMOS, K2/2 should be around 14.45e-3, to be more accurate. But, then the linear region K2 definitely falls due to mobility degradation into the saturation - and this can happen differently for NMOS and PMOS. 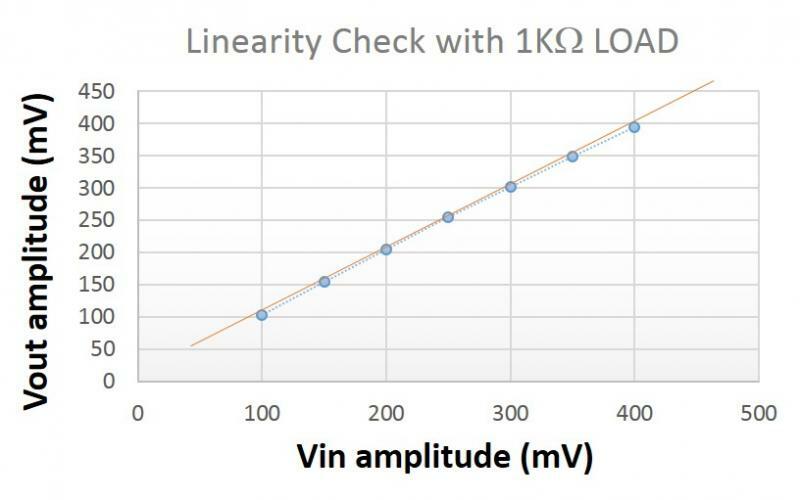 In reality, the square law curve has no value for a sub-100nm fet. Only thing that needs to be checked is if the gate-drain tied NMOS has its drain current sufficiently linear with respect to the drain bias (see the red line suerimposed on the green curve). 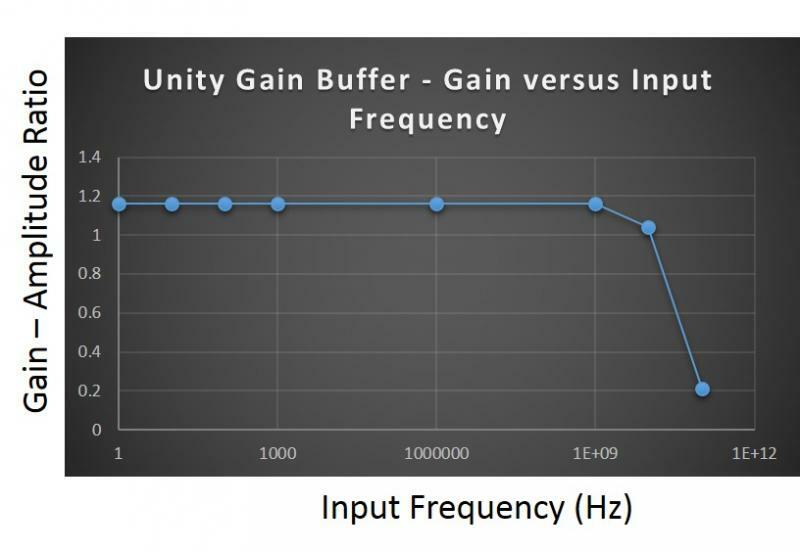 If so, the buffer can work as a linear amplifier. 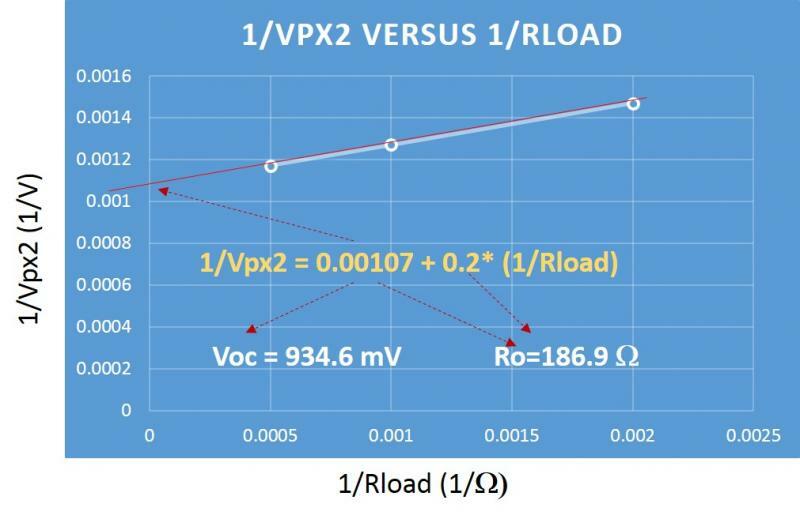 Vth1 of 1V for VDD=1.8V to ensure no PMOS cutoff at max input swing of 800mV; and Vth2=0V to bring the floor of the output swing close to 0, and vpx1 lower so that PMOS remains in just saturation at the min of input swing (0V). W,L values are adjused to get a reasonable output impedance, and to control the Vpx1, Vpx2 points so that the PMOS always remains in saturation. The NMOSes are always in saturation by connection. This way, the PMOSes are being used as square law devices (squaring the input Vin), and NMOSes as squareroot law devices (squarerooting the current) - yielding a linear gain on Vin. This "code snippets4" page is a continuation of the "code snippets3" page.